Living in these days can mean a lot more that just having a shelter, food and clothing. People have evolved a lot in the last 50 years and the trend is of an exponential growth. The differences between generations will be more significant than there are now. As a proof that people have already started to change their minds and philosophy are the random bursts of nonconformism, meaning that some people no longer feel represented by the masses, and their image can’t be associated with an institution of a large group of people. Part of the nonconformism I was talking about is the residential component. 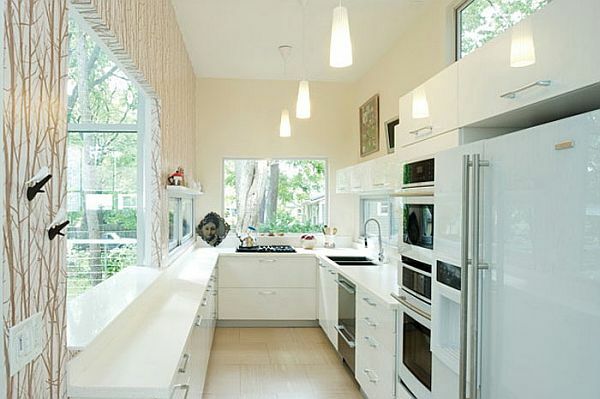 People live in more and more diverse houses that suit best their needs. 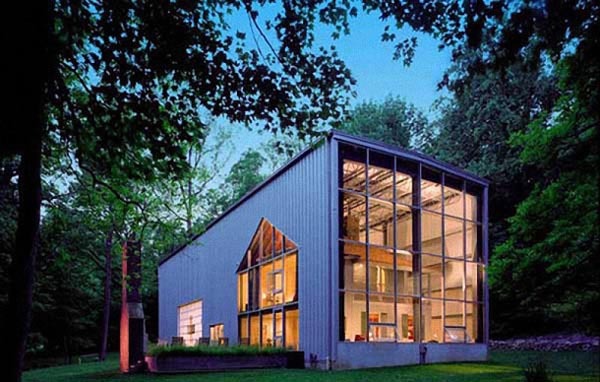 Some people buy large houses with concrete structures or steel and glass to reinforce their social position and other people choose something different but always a place that suits their needs. 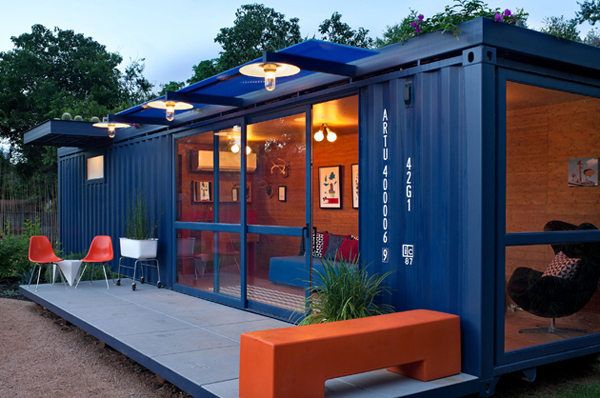 A crazy idea is to live in a container. 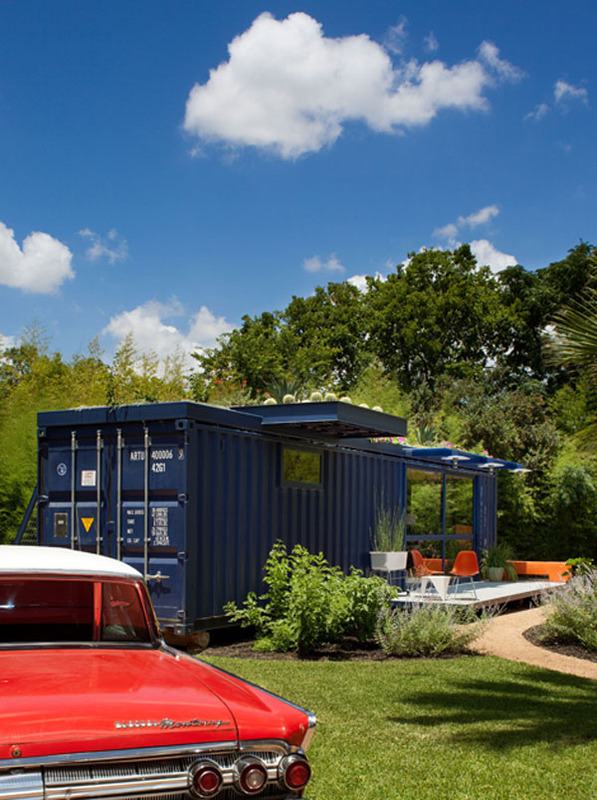 Yes, you’ve heard me, those cargo containers represent now for some people a part of their home ,or even the entire household. Don’t rush into conclusions yet, let’s take a look at some wonderful structures and then let’s draw a conclusion together. 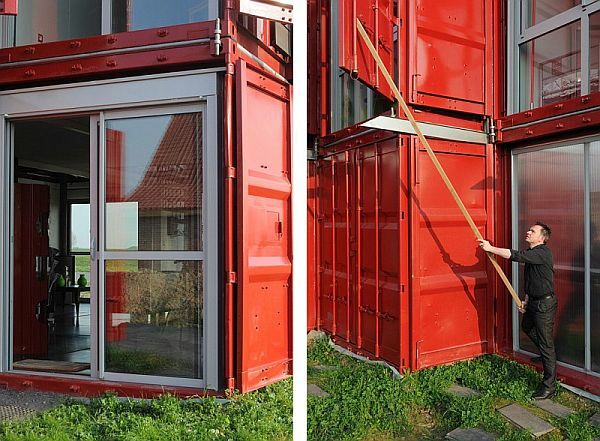 Lets just remember the average cargo container costs about $2000 USD. 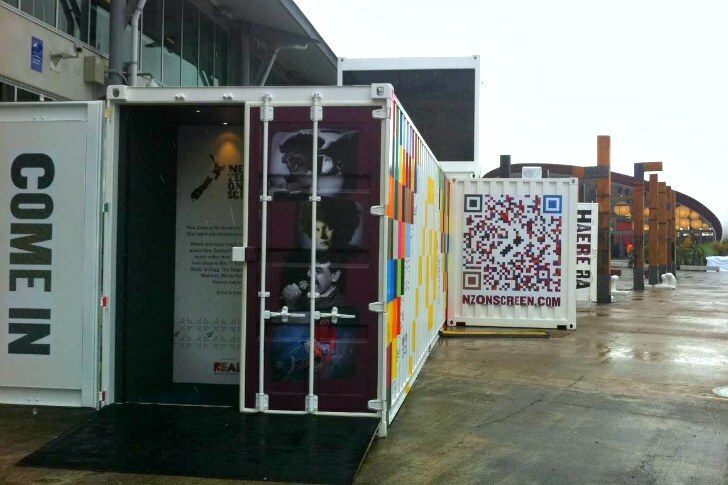 We also included a couple of business locations that utilized this concept just to show what it could do. 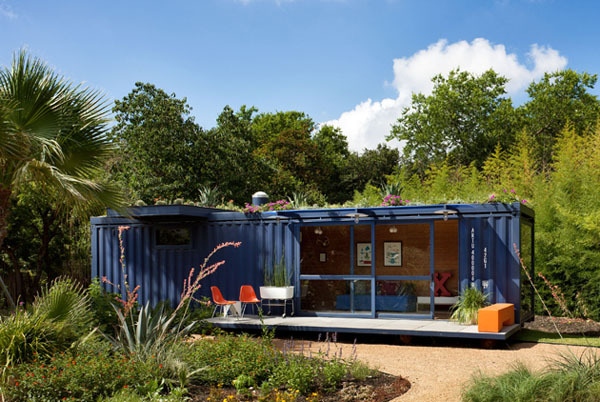 One of the most interesting projects I’ve seen so far is this wonderful guest house made out from a recycled shipping container. 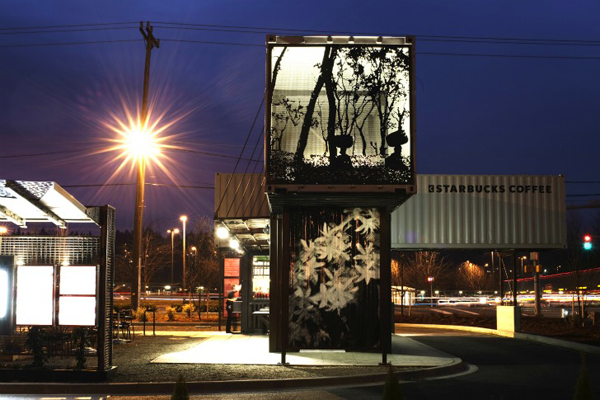 Because of the container’s nature not a wide range of possibilities is available to decorate it, but people take this always as a challenge and in this case it turned out great actually. 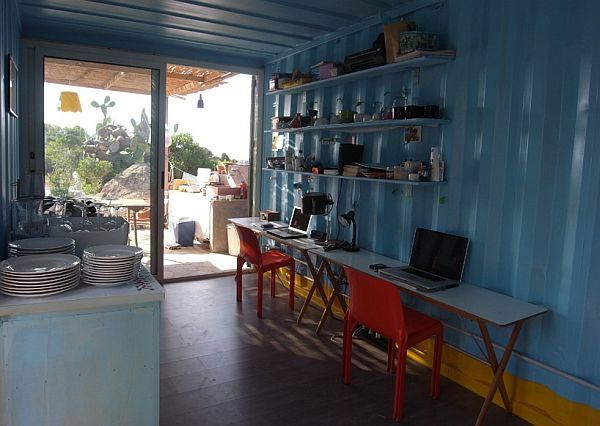 The container was painted blue and two sections were cut and windows and big sliding doors were mounted. There is a small patio in front and above it a bit of a roof so the rain doesn’t smash directly into the door. 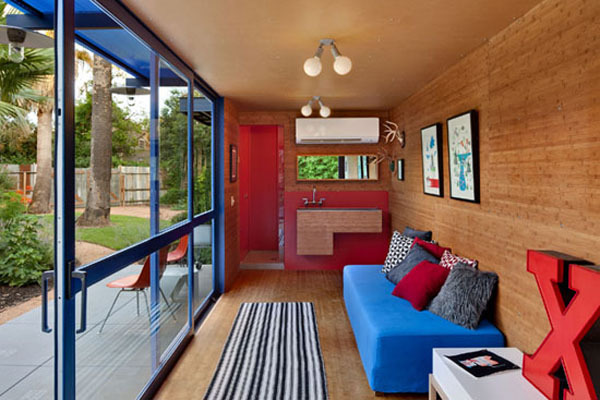 The interior feature wood panels on walls for the sensation of warmth and comfort. This creation over here defies the anything you knew before in matter of houses. 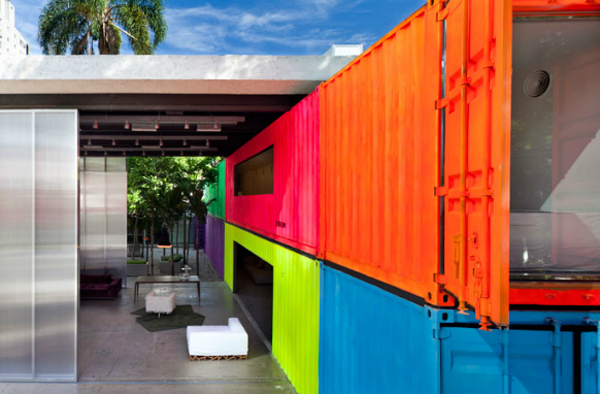 This beauty over here is made out of containers. 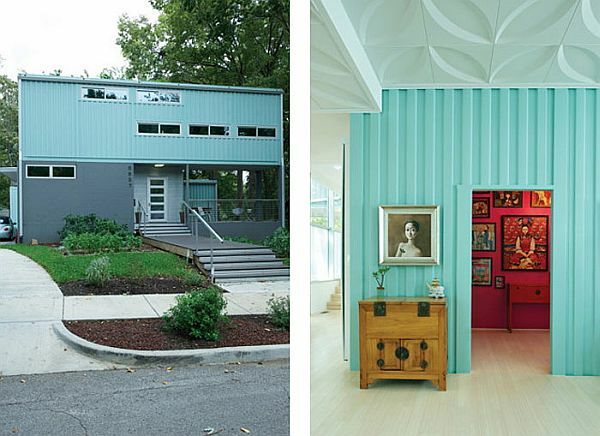 New Jersey architect Adam Kalkin designed and build his own house from recycled shipping containers. Among many reasons to do that there is price( a used one costs under $ 1000 ) and durability. This house is huge and structure on different levels. 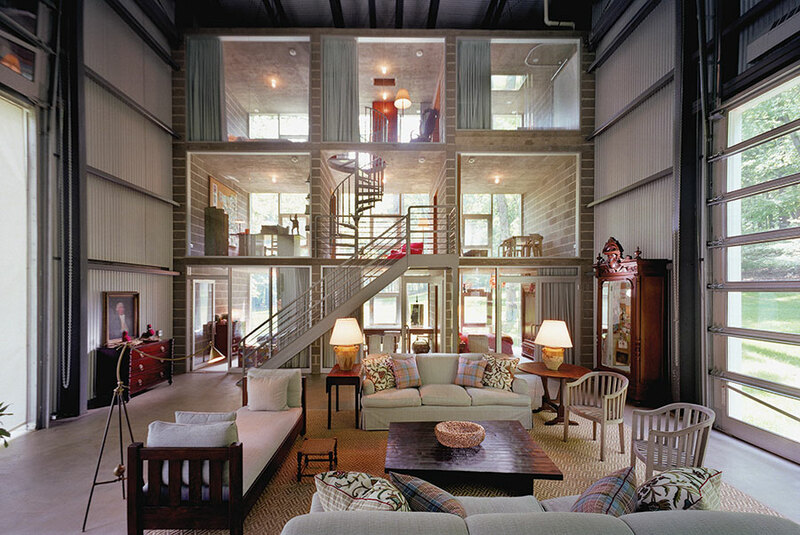 You could say that this is a “house in house”, because inside the massive building there are smaller individual components that look like a traditional house. 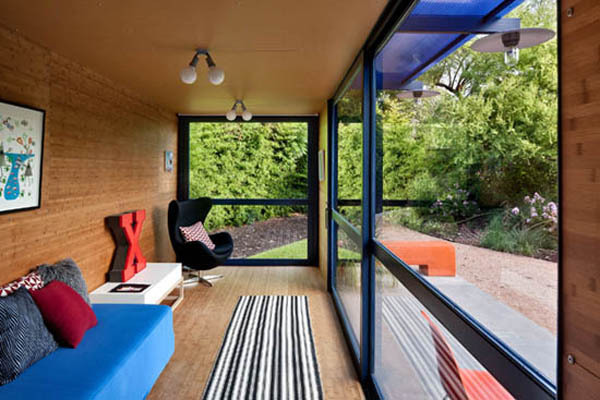 As a matter of fact the indoors is combined with the outdoors through massive sliding glass doors and also by the house-like structures built inside. You can very easily get confused about this place. 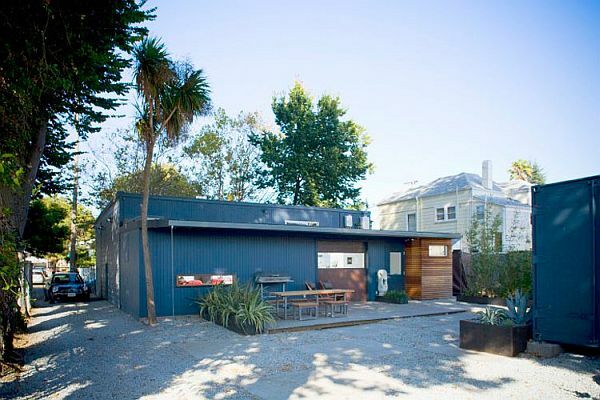 It’s not a traditional house for certain, but what is it? 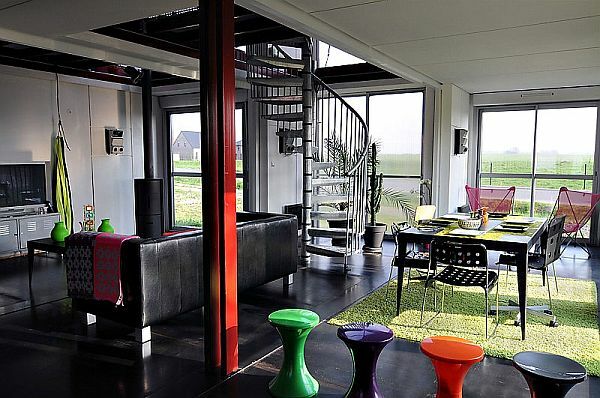 It has bedrooms, bathrooms, living rooms , kitchen so it fulfills our modern need but what about aesthetics? If I really have to answer I could definitely say , unique! 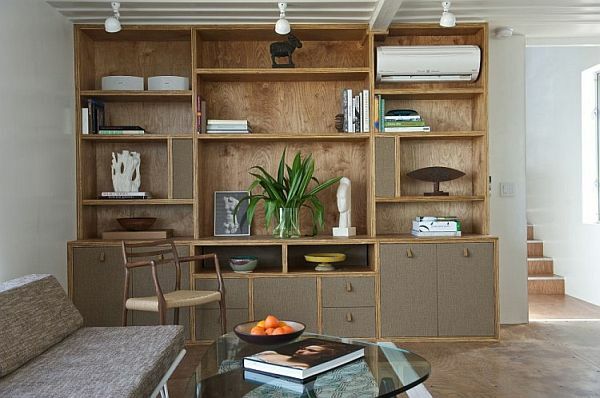 Another impressive project belongs to Brazilian Architect Marcio Kogan. 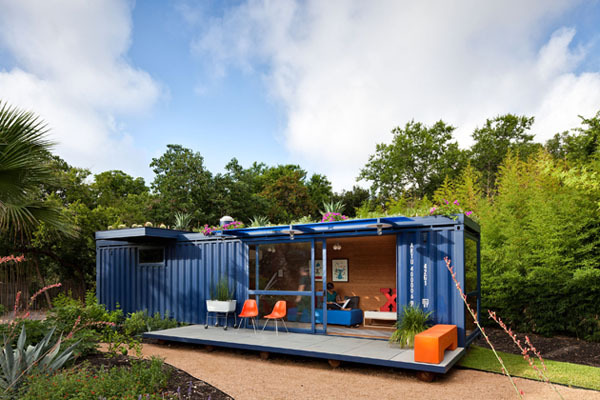 This maritime shipping containers home was born with the idea of making use of industrial elements that can be easily assembled and also in a very short period of time. 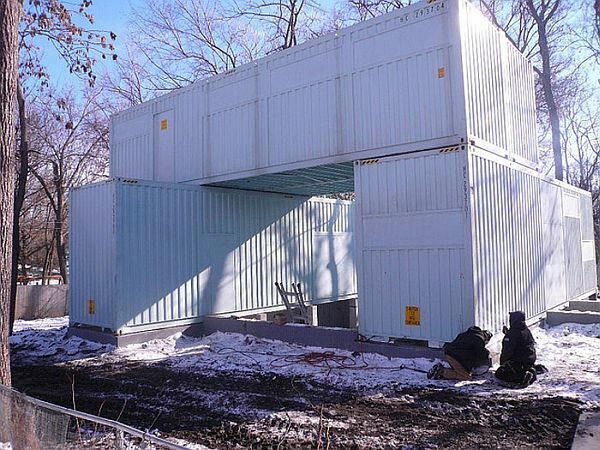 To deal with the special limitations due the predetermined size of the containers they stack the containers on top of another. As soon as the height limitation was solved their attention focused on width. 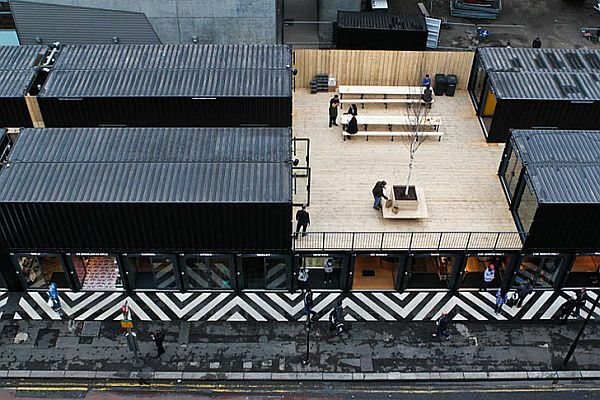 To solve this one the architect created a space that high as two containers but wider. 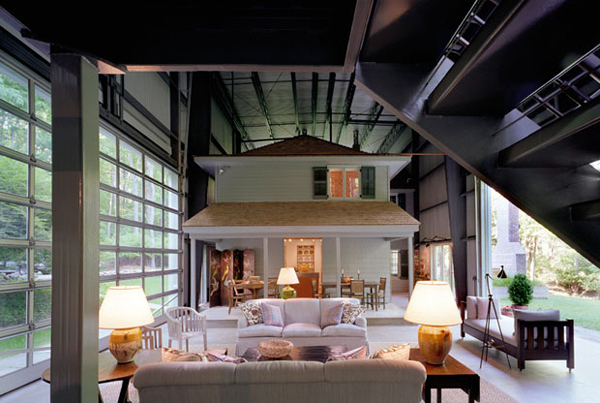 In that space was possible the arrangement of a great living area that can extend outdoors thanks to a clever retractable system of doors. 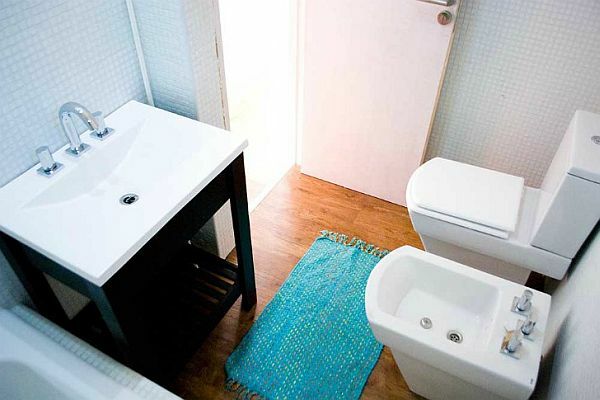 This household has all the facilities of a normal one just in a different style and unique idea. 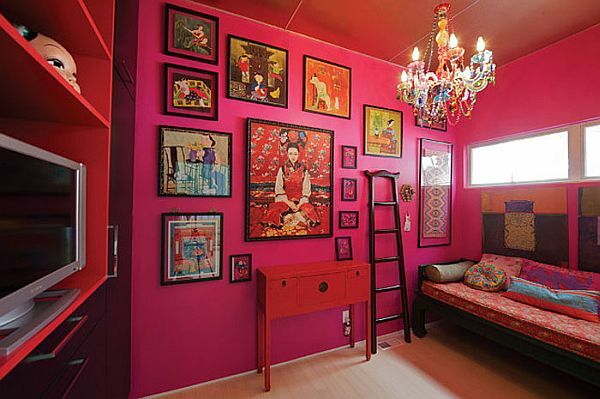 Along with the vivid colors and green environment comes the spirit of a youthful space completed by fun and joy. 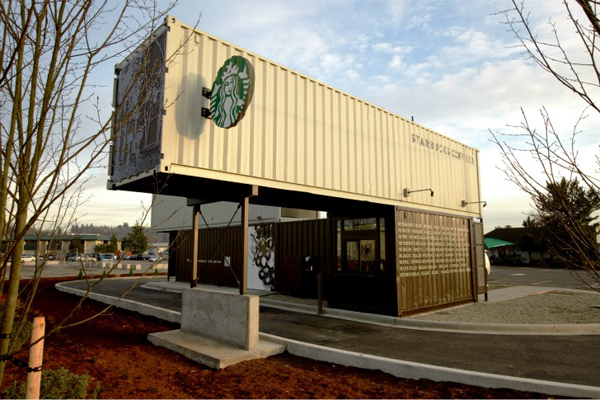 If so far we’ve seen shipping containers used as a living place here is a daring idea of a business man who has imagined his new Starbucks building a little bit different compared to what we are used to see. 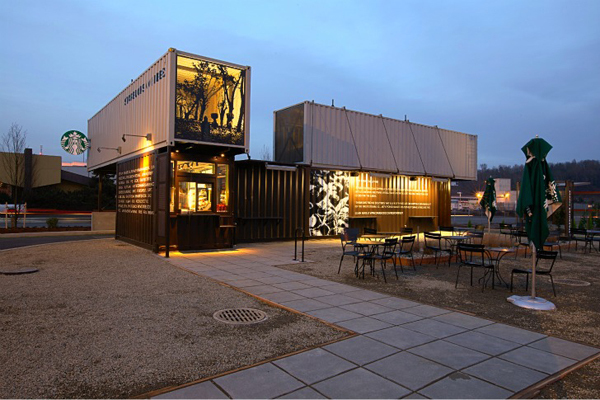 That crazy idea came from their extensive use of these containers to ship their coffee and tea from all over the world. Perhaps this is just a cool strategy, by wanting to associate their products with freshness, who knows, from that point of view we’re not interested just yet. The design is unique even for a drive-through fast food type of building, but maybe this particular fact made it possible. 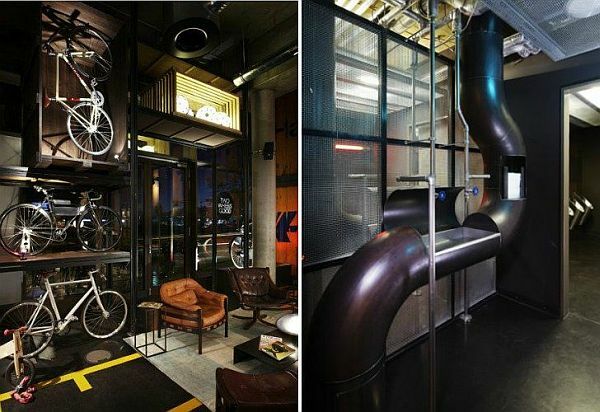 The fact that their new building can house only coffee machinery and a small working area for the employees made this a perfect choice. It is cool and interesting and can be perceived as a road opener for other businesses that don’t necessarily need a big space inside. This alternative is fast, easy less expensive, and after you’re done using them you can always recycle for an extra buck. Now let’s take a look at a more complex project. 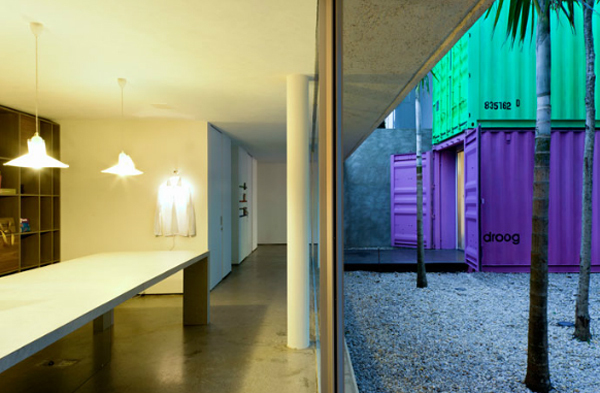 French architect Patrick Partouchedesigned in 2010 a place that although is build from cargo containers tends to imitate a traditional house. 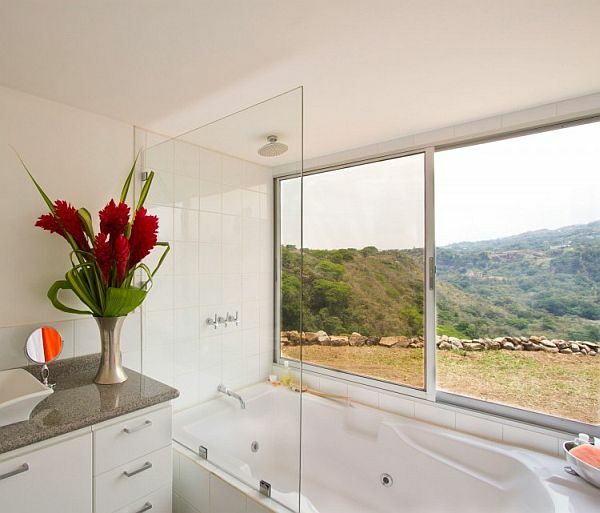 This contemporary house has approximately 2,240 square feet and cost around 221.000 euros to complete. 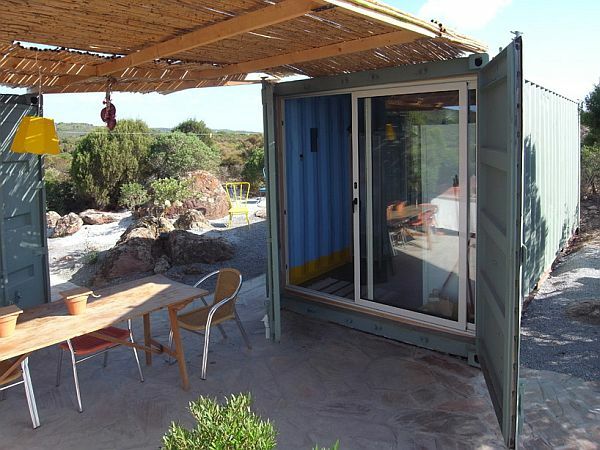 As we can see it is made from multiple containers cu different section cut either to achieve a larger interior space with great living and dining areas either to fit large windows and doors . 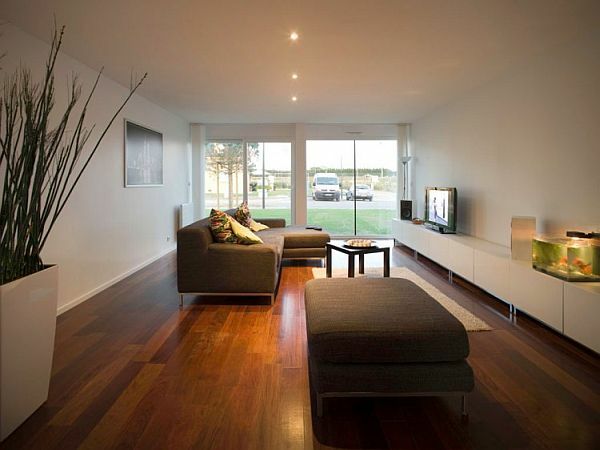 Inside, the house looks spacious and modern thanks to modern appliances and furniture. 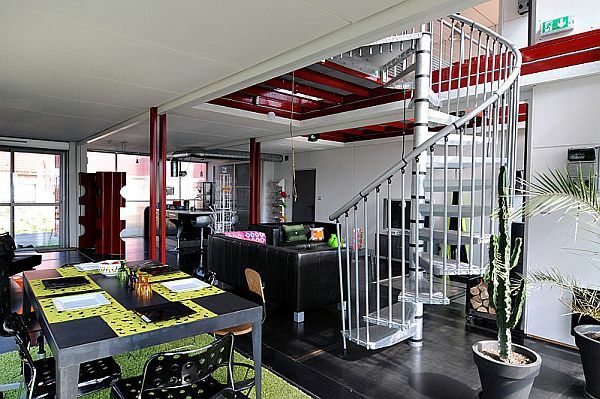 At the upper floor amazing living solutions were implemented united by metallic stairways and bridges. 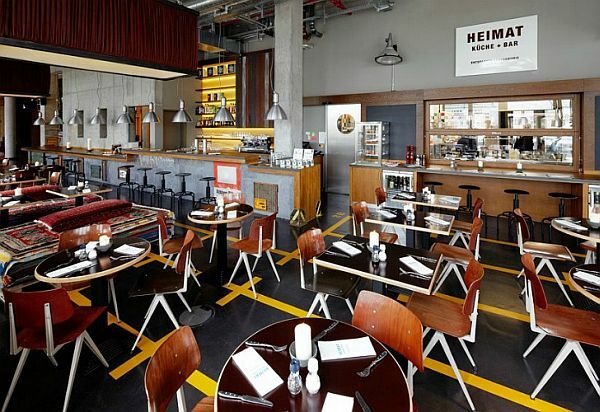 Plenty of natural light comes in making each metallic corner or junction shine highlighting the industrial theme. 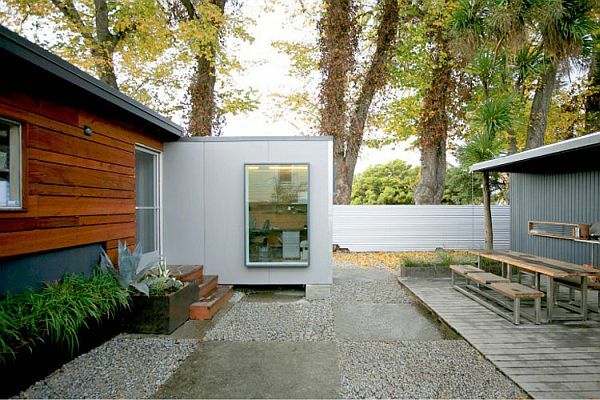 What I like most at this house is that they kept the container’s door, leaving the owner’s the possibility of closing them to achieve full privacy. 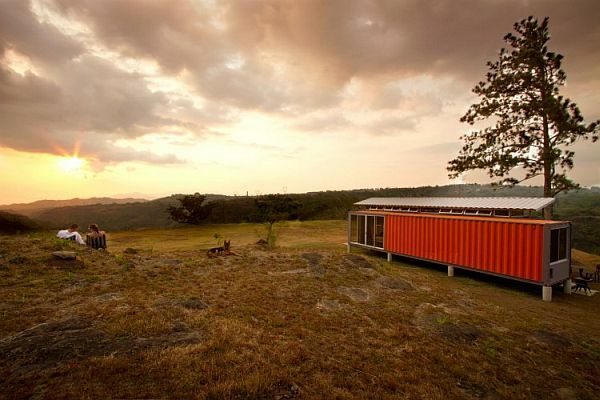 Benjamin Garcia Saxe has built with $ 40,000 an interesting place to live in Costa Rica. 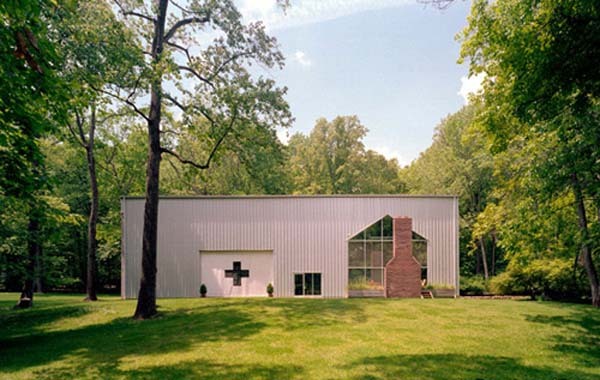 This project concentrates more on a communion with nature than actually building. 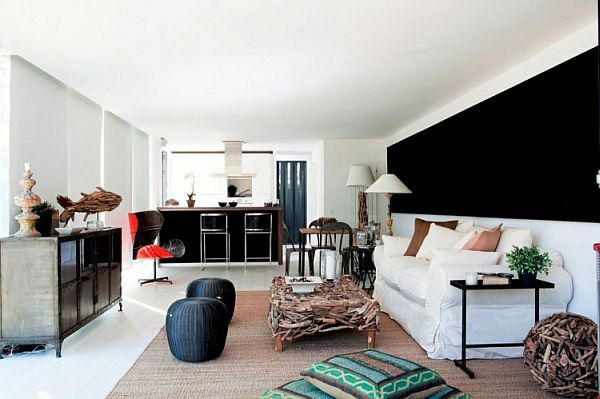 This house is very chic and modern but it only takes a small amount of materials and space to function. We all tend to build vast spaces that very often are left inhabited, but this focuses more on what we actually need and don’t need. 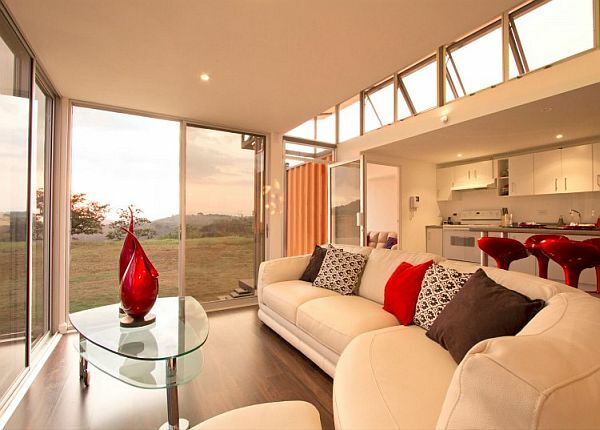 Let me tell you what we really need: a sunrise and a sunset through those wonderful large windows, we need comfort and we need style. 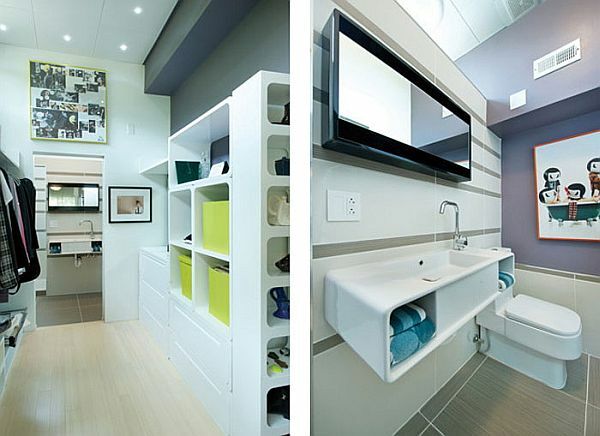 Thanks to modern furniture and quality finishing we can achieve all these within exactly 1,000 square feet. I would have to say that this is a place for the soul and eyes. 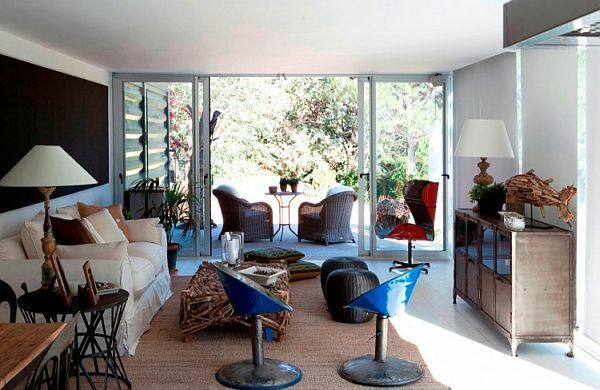 An intimate, cozy house with the best view over the surroundings is probably what many of us would want. 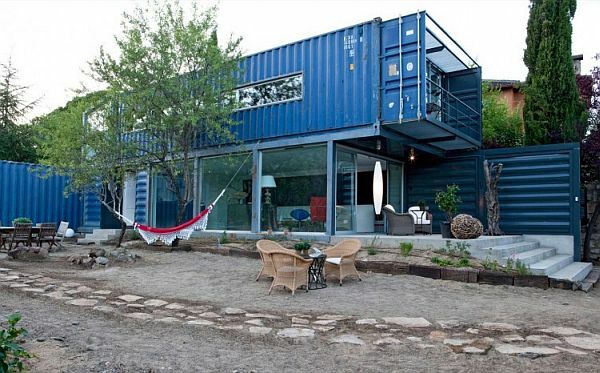 Well, it is possible to have just that with just two shipping containers. 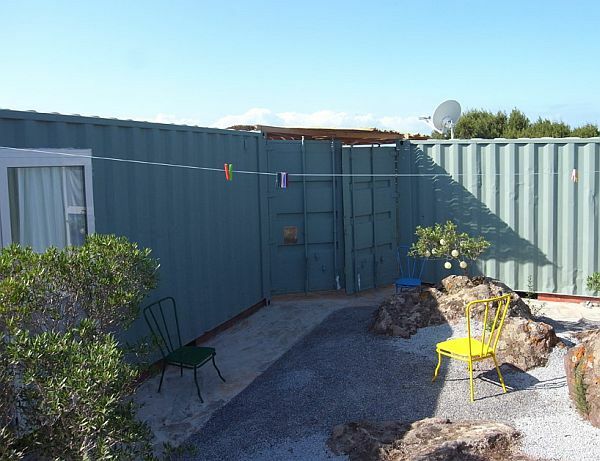 This residential projects over here involves four 40 feet shipping containers and although it doesn’t look very good from the outside, inside I assure you is superb. 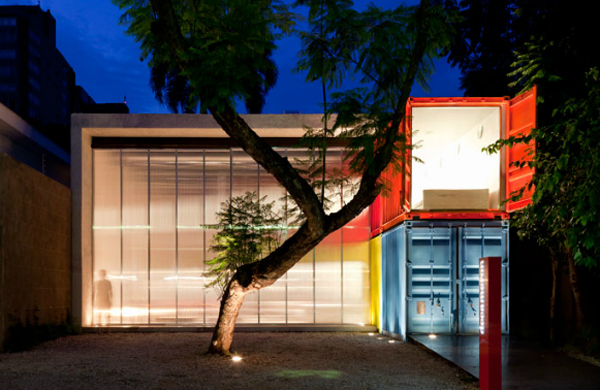 It was designed by studio James & Mau Arquitectura and built by Infiniski, , is located in the province of Ávila, Spain and it was named “Casa El Tiamblo”. 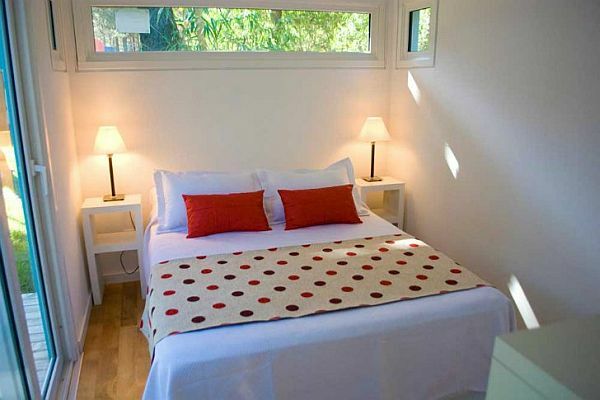 Costing around 140.000 Euros this modern example of style and comfort has all the facilities of a traditional house., with a big kitchen, a great open living room surrounded only by immense windows, comfortable bedrooms and trendy furniture. 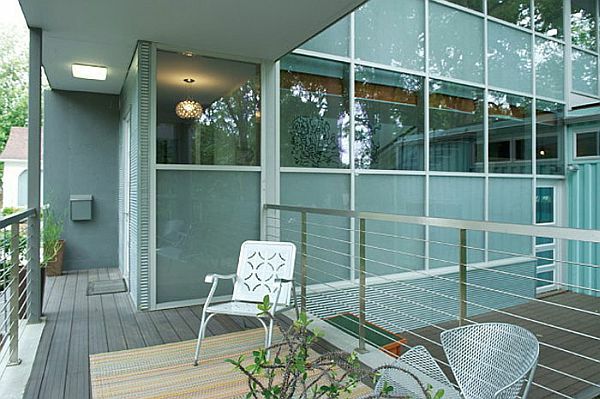 Probably the most appreciated area is located at the lower lever because it features sliding doors to the patios creating so an space where you can relax and feel the fresh air that circulates cooling and ventilating the household. 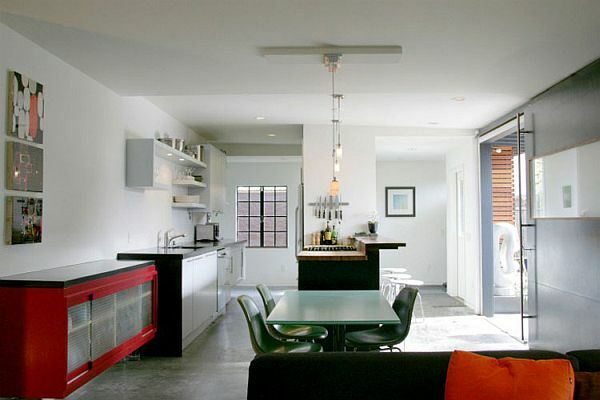 Furniture makes this household look no different than a traditional one and perhaps that is why feels so cozy inside and modern and stylish, compared to the raw industrial image, when looking from the outdoor surrounding place. 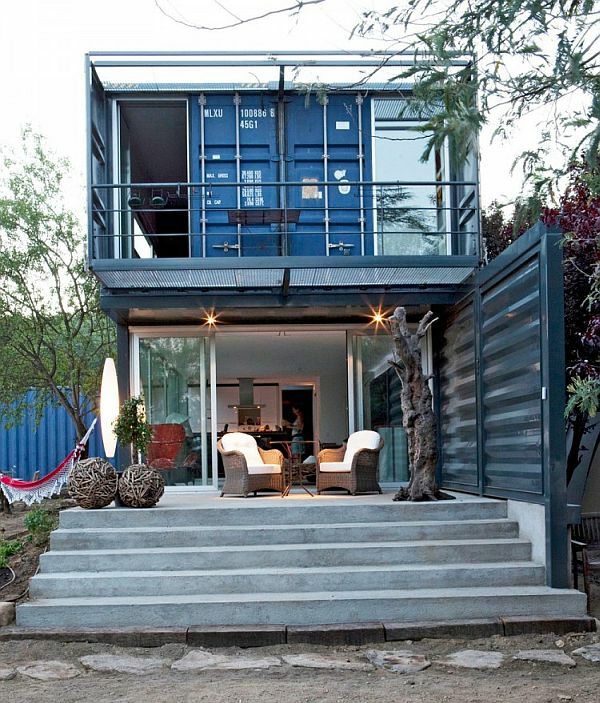 Container houses are here taken to another level. 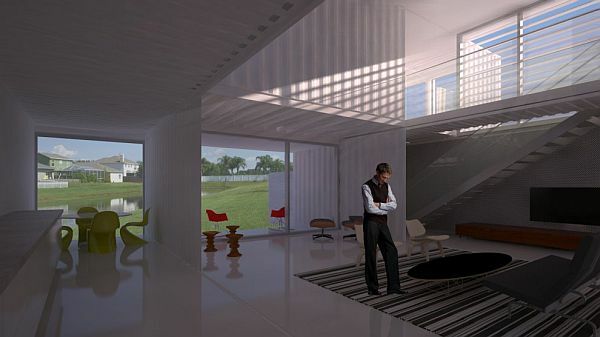 If so far we’ve seen homes made in less professional manner, Ecotech Design introduces their version of a shipping container house. 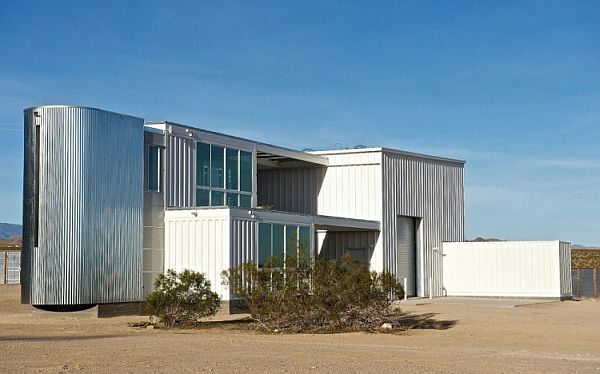 It is located in the Mojave Desert, it has 2,300 square feet structured into a one bedroom, one-and-a-half bathroom 6 containers residence. 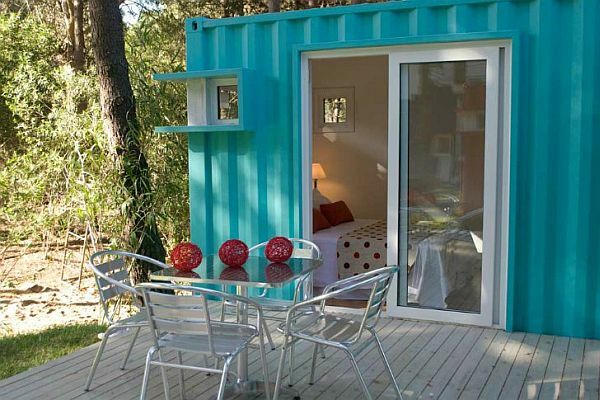 The design speaks for itself , offering for those who are interested more that shelter. 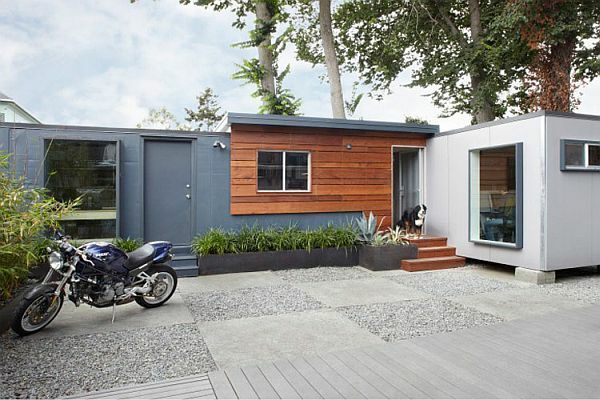 This unique design features a modern interior with open space solutions and plenty of natural light and an exterior area that combines shady places with an open space yard. 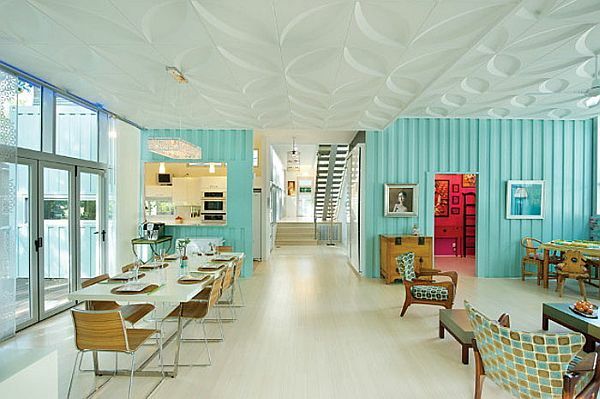 I have to admit that if nobody said to me that this is made from containers I would had never guessed. 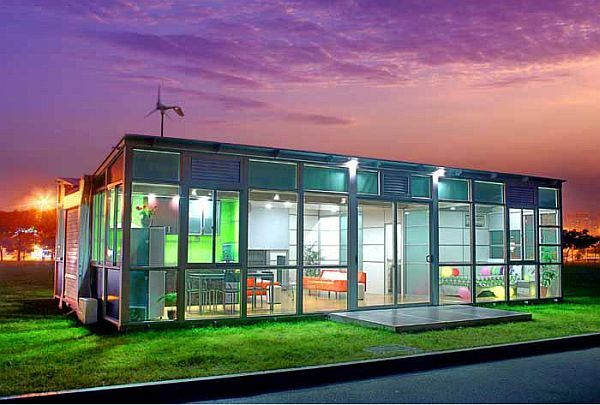 It looks like a modern facility build in a certain eco spirit. 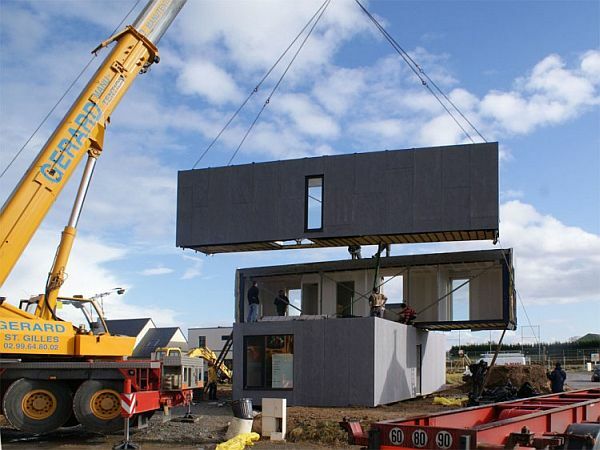 This amazing structure combines high-energy efficiency and mass-production modular structures, making it a low-cost, sustainable house system. 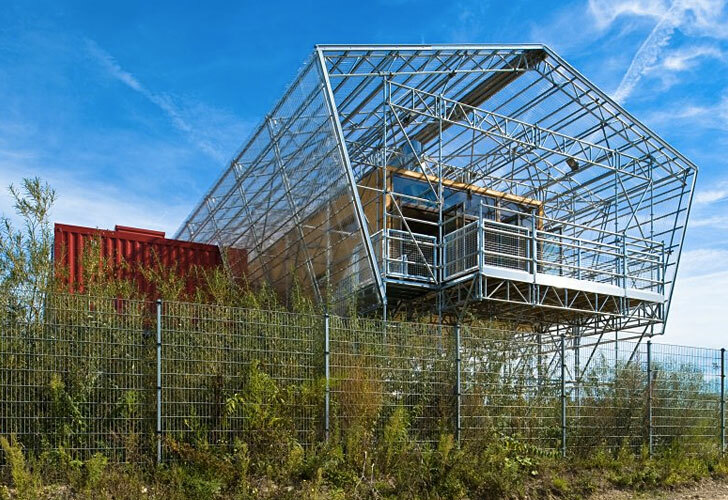 If we take a look at nowadays trends , I guess that in the near future we’ll see more and more of these structures all over the world. 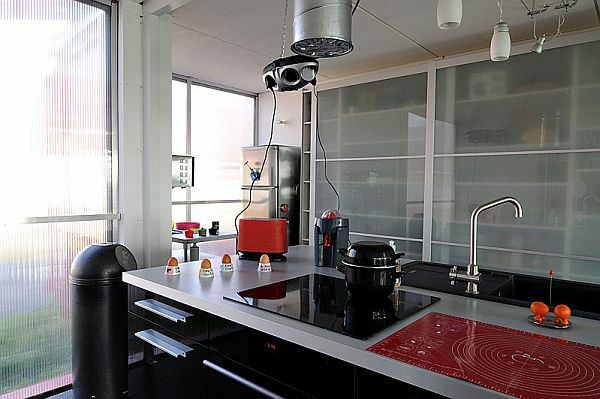 In this project we can see combined two different elements that you would never see them work hand in hand. 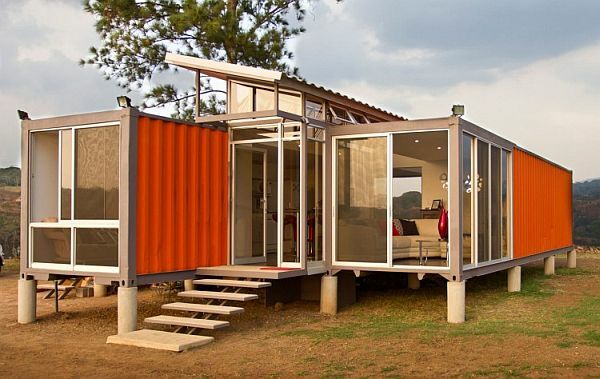 I’m talking about open space and shipping containers. 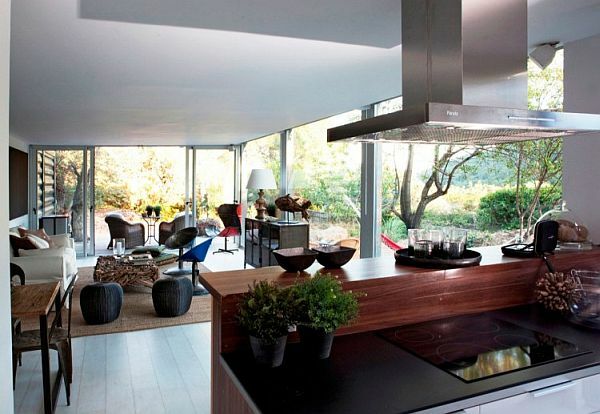 This incredible house shocks through brightness, arrangement and facilities. 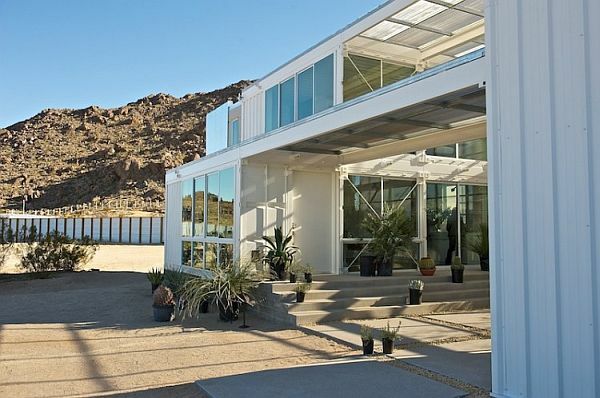 Made out of only 5 shipping containers this house has a total of 2,600 square feet of comfortable living spaces, on top of that it has a green roof, geothermal heating and high-tech foam insulation to preserve the best living conditions available at this moment. 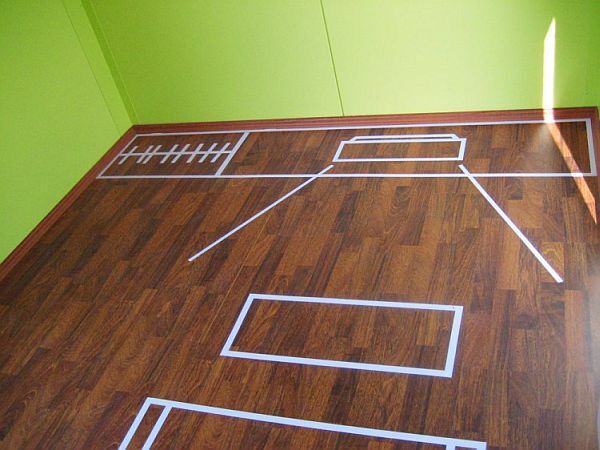 Being a fun project to design and build the entire project has a playful note, but it not a joke. 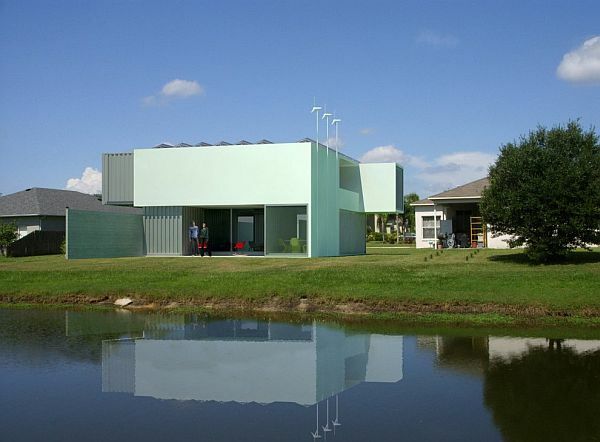 This is a real everyday home for a happy family with needs and perfectly integrated in society. 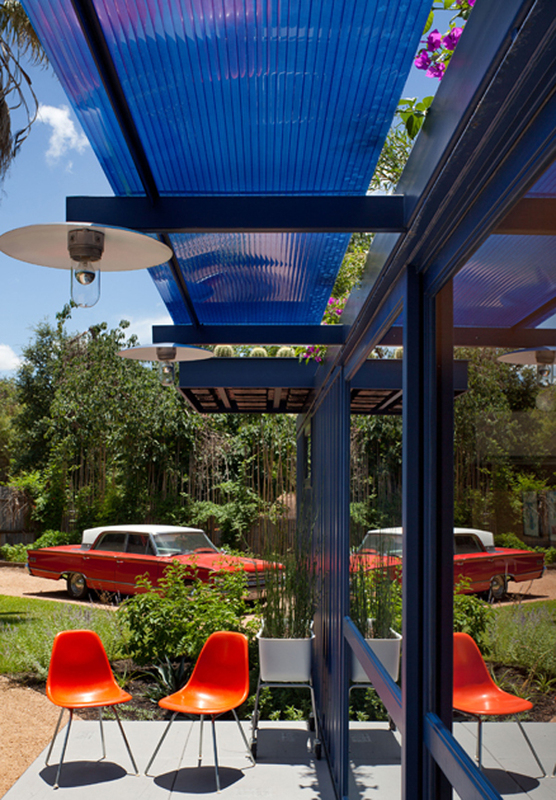 The cold metal industrial style has been dramatically diminished by bright, vivid colors and modern furniture. I love how this project turned out and I think is great giving the conditions and materials used to build it. 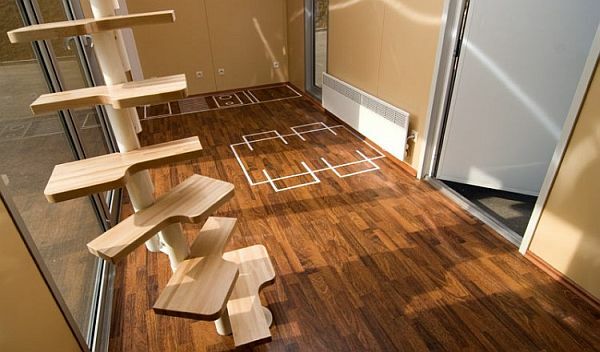 Wonderful design, great living facility! 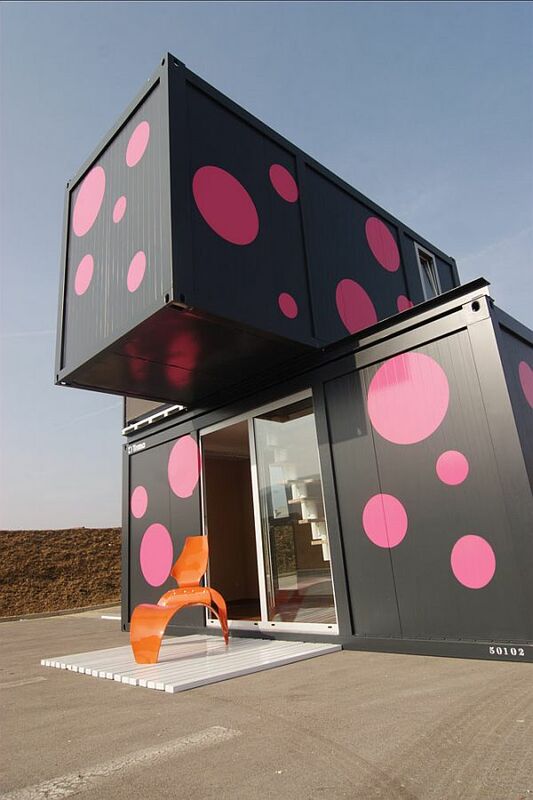 10 | Shipping Container Conversion By Building Lab Inc. Designer Stephen Schoup build for his expanding firm a new work area. 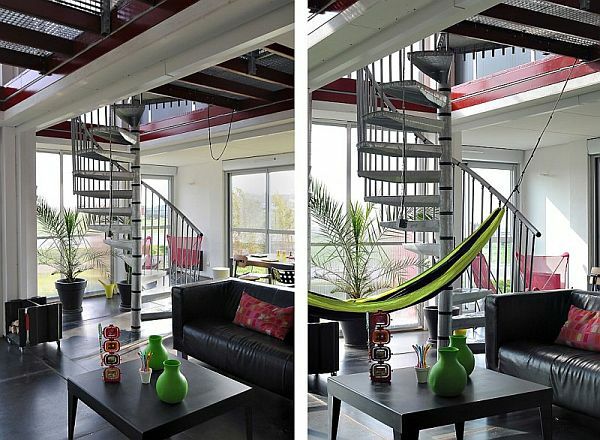 Their concerns about environment and sustainability convince him to opt for an unusual way to create the additional work area. 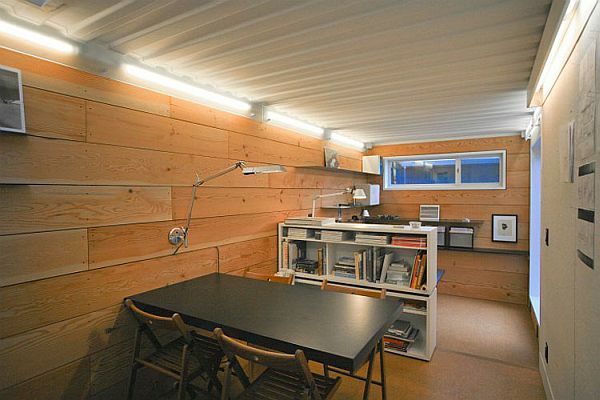 After many deliberations he decided about an L- shaped shipping container office by Lab inc. 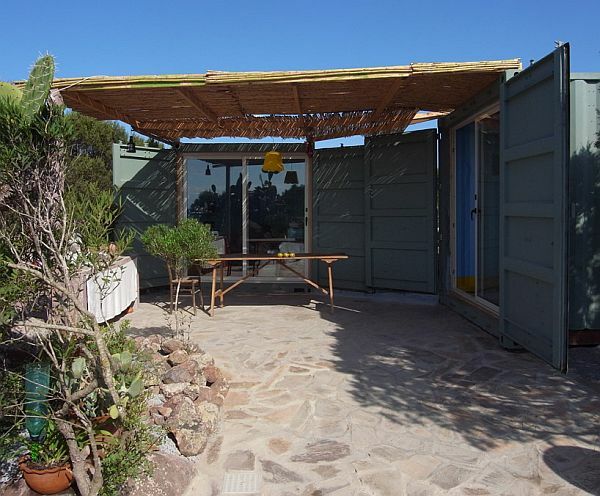 The great thing about this structure is that allowed Stephen to incorporate a lot of leftover materials and supplies he had laying around the courtyard. 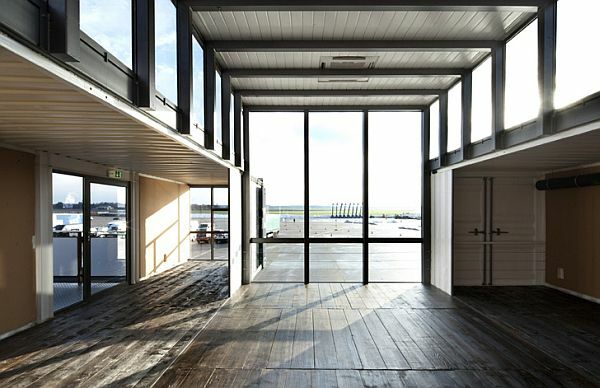 The result balances the industrial style and the warehouse appearance with the great open space found around the structure. 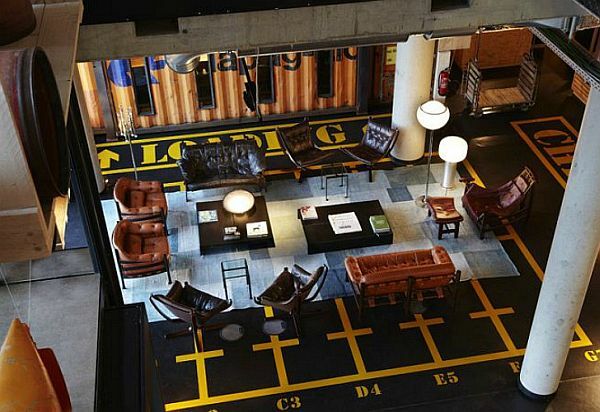 The interior is perfect for an office area and the space is utilized at its maximum potential. There is enough space for a small meeting and also very well equipped so, those who work there have anything they might need at hand. 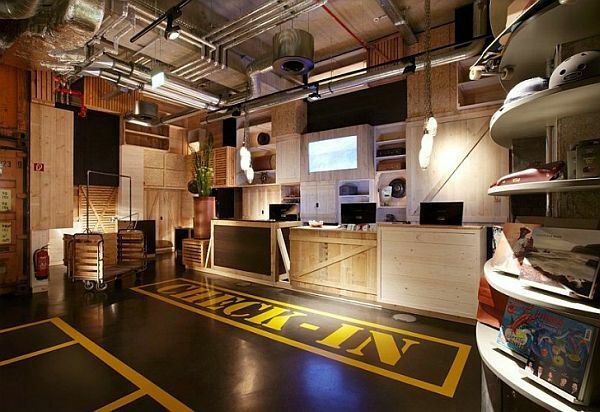 This office continues the residential theme, the house being also made in a non-traditional way. 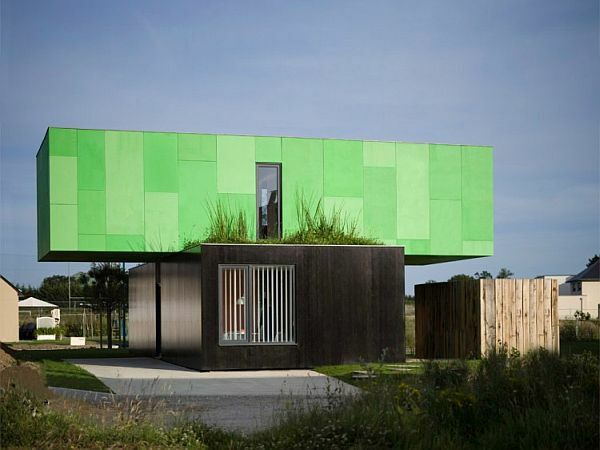 As a proof that this container house phenomenon is spreading all over the world and that different regions and architects impose their preferences regarding design, in FranceClément Gillet Architects build an eco-friendly prefabricated single prefabricated residence. 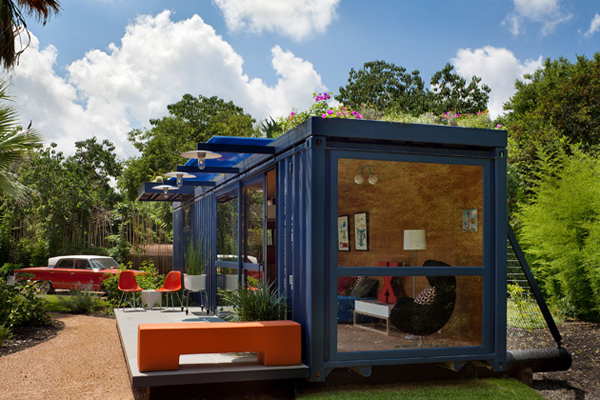 The main ingredient to this successful recipe were some old shipping containers . 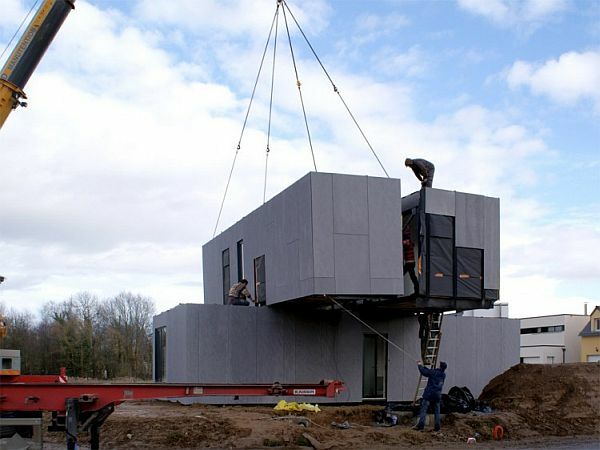 The residence has approximately 1,120 square feet and it’s a prototype of modular , industrial house made from four containers. 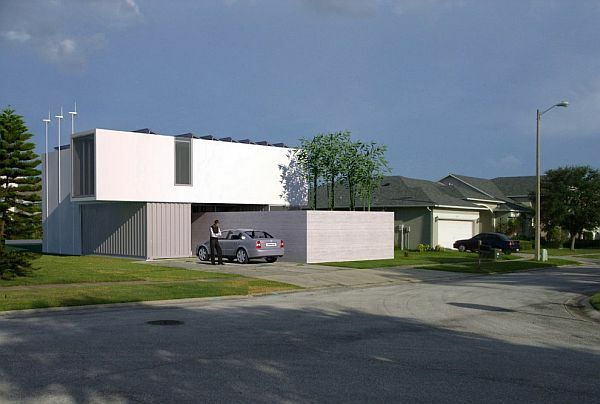 The main idea behind this project aims to build low cost architect’s houses focusing in the same time on the environment. 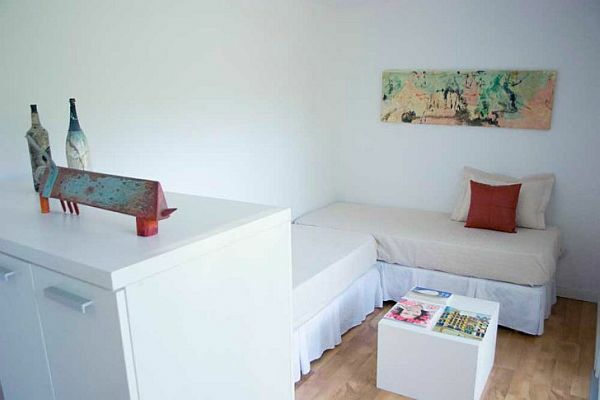 The big success is due to its very simple design with a living area on the ground floor and three bedrooms on the first floor. 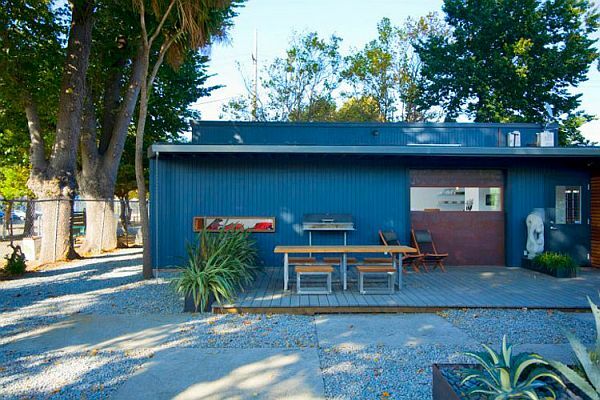 The entrance is between the two volumes used also as a great carport. 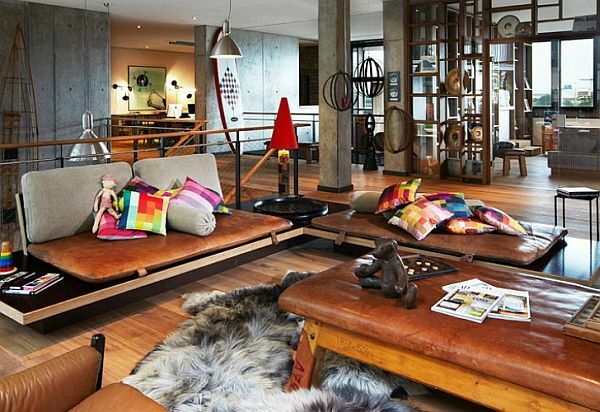 The interior is well finished with bright colors and furniture to create the impression of vast space and the wooden touches warm the entire house making it a great place to live. 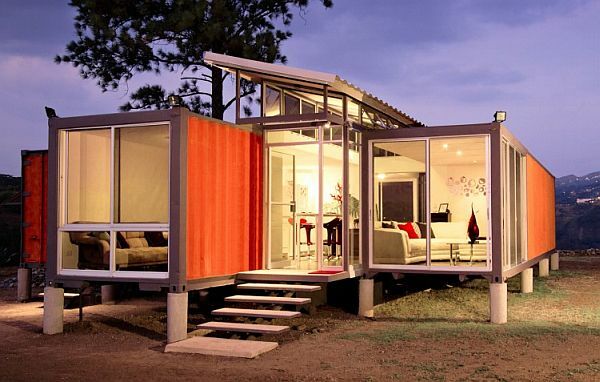 This can be better described as a mini housing solution offering only the basic condition for living. 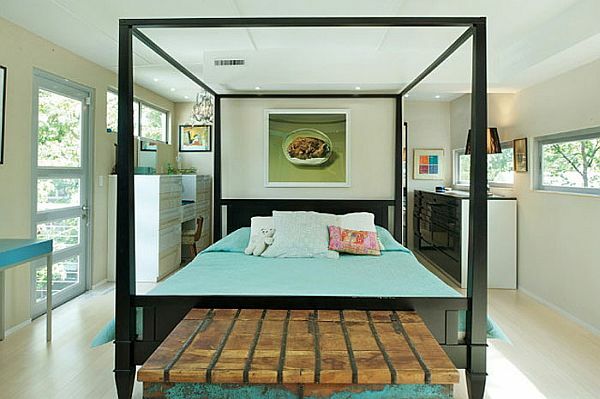 This can be a great stylish temporary solution if you’re planning to invest a more considerably amount of money in your dream house. 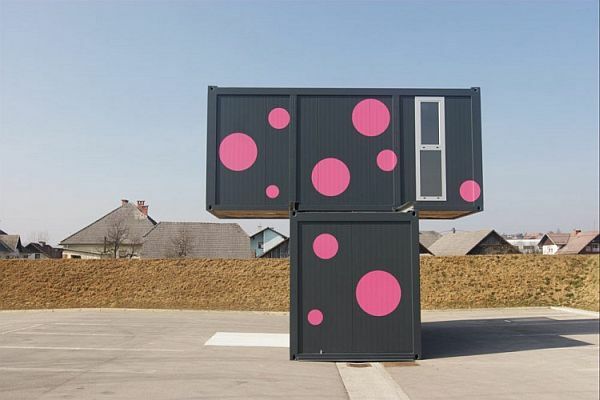 Its pink-dotted façade illustrates the versatility and the opportunity of expressing yourself so other people can see your true spirit. 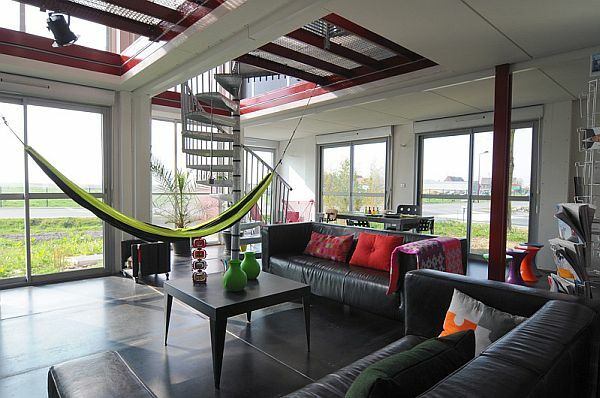 The interior can be furnished stylish but very minimalistic and the upper floor is accessible through an adjustable staircase. 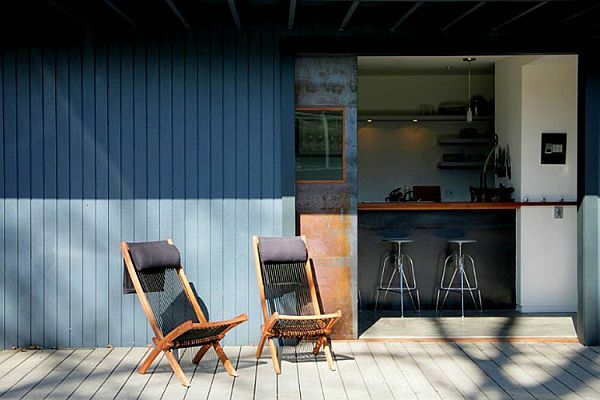 Their minimalist look focus the attention on the paradise outside. 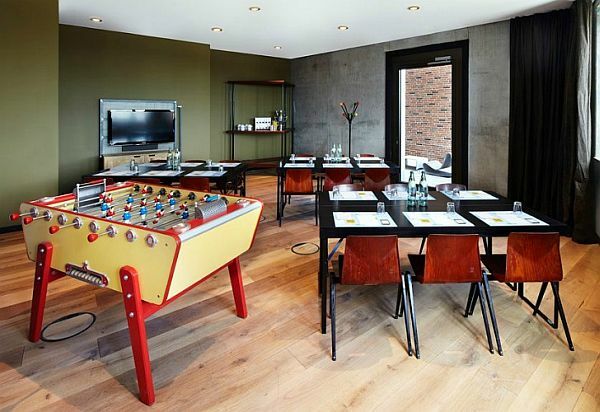 The resort was originally an art gallery and to transform it in a hostel they changed some of the spaces and added some additional cabins. 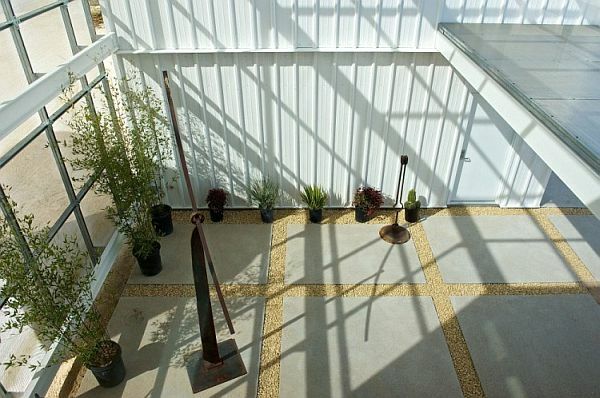 It is important to know that no tree was harmed during constructions and the main house still functions as a gallery. 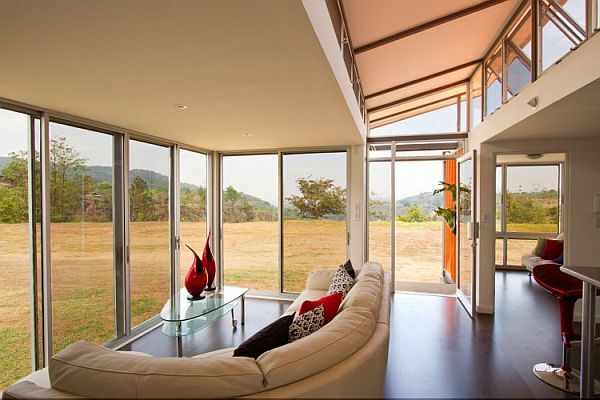 So, you can look at this location as a place for the soul and body with prices starting around $US 1,100 per week. 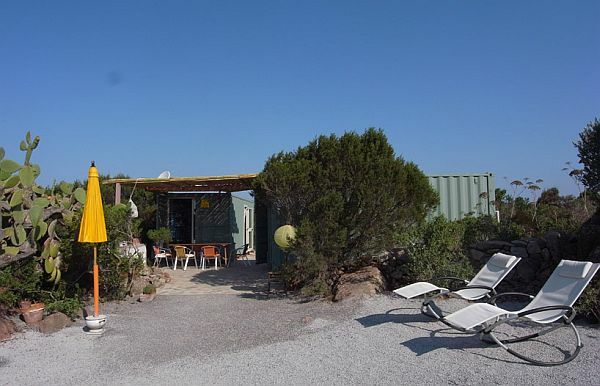 Think of it as a very cool camping site with the best conditions for a true relaxing experience. 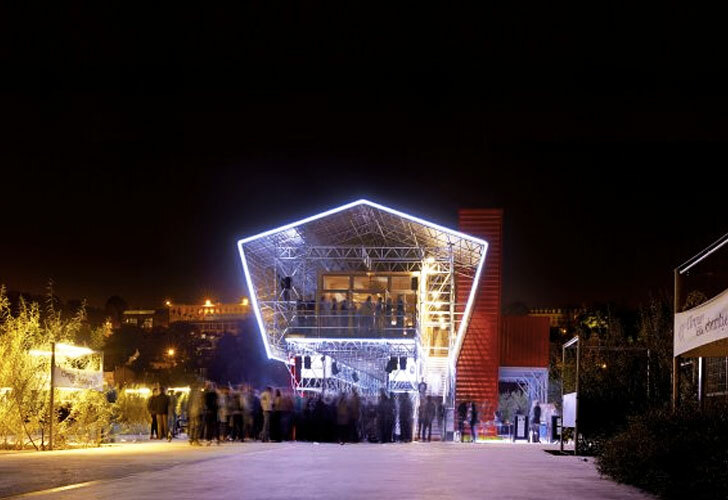 Another interesting project was mastered by the French architect Jean Nouvel. 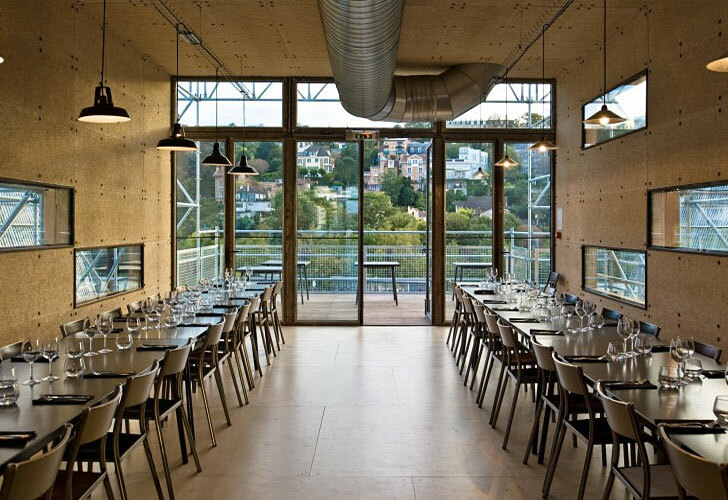 He imagined LES GRANDE TABLES as a large timber frame structure wrapped in glass, and as we can see it turned pretty good actually. 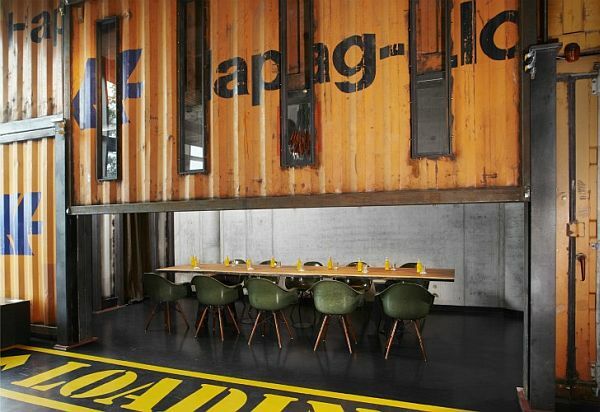 His 1,000 square foot restaurant is made from recycled cargo containers with bare bones scaffolding around for a true minimalistic , industrial look. 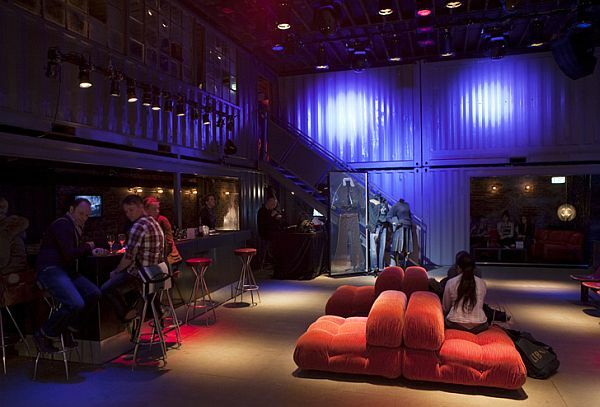 Over 120 people can fit in it and is also used for parties, weddings and cultural meetings. 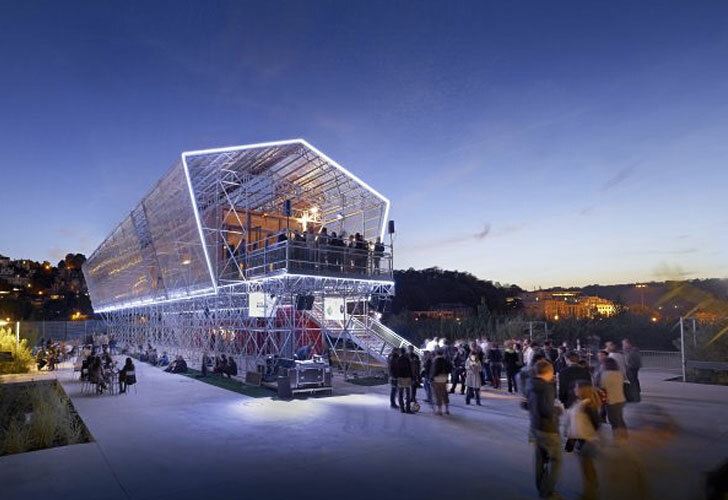 This structure is part of a larger project but this is supposed to be the main attraction, also because the restaurant serves French cuisine cooked by the famous chef Arnauld Daguin with local grown spices and vegetables. 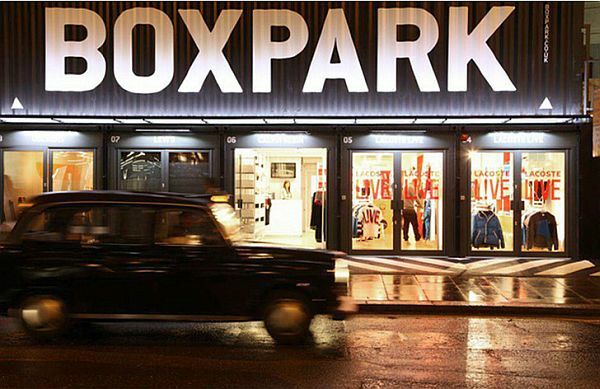 When the night falls the place get animated by people who want o piece of a certain lifestyle. 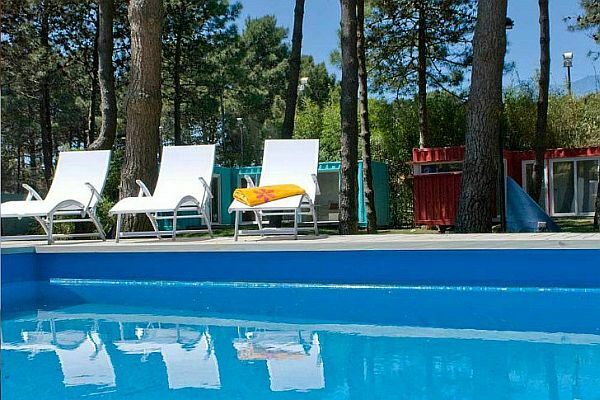 French people are well known for their sophistication and revolutionary thinking , this makes them leaders in design trends and taste, and by looking at this structure we can very easily see why. 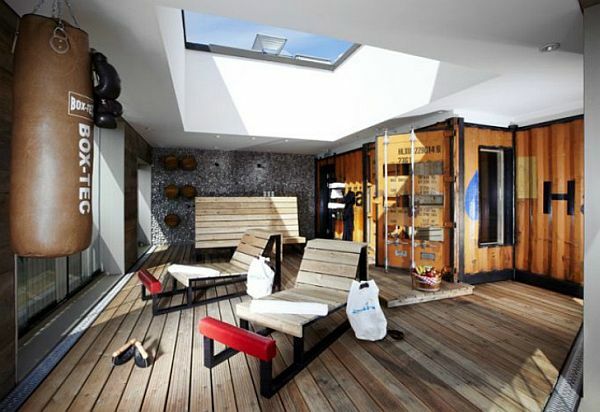 Commercial spaces come in different shapes and designs to attract as many clients as possible through an appealing look. 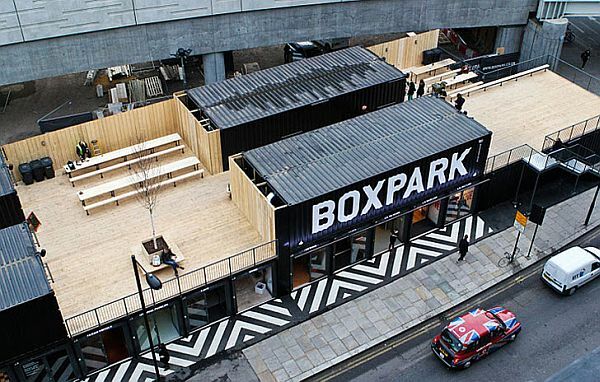 Boxpark Shoreditch is London’s first pop-up shopping mall made completely from shipping containers. 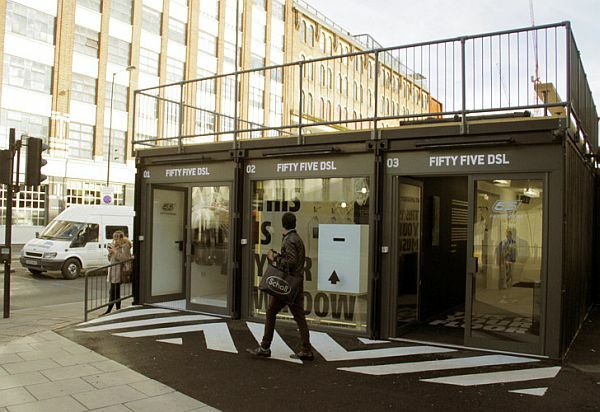 This crazy mini shopping center is convenient, pedestrian friendly and packed with some of the most popular stores. 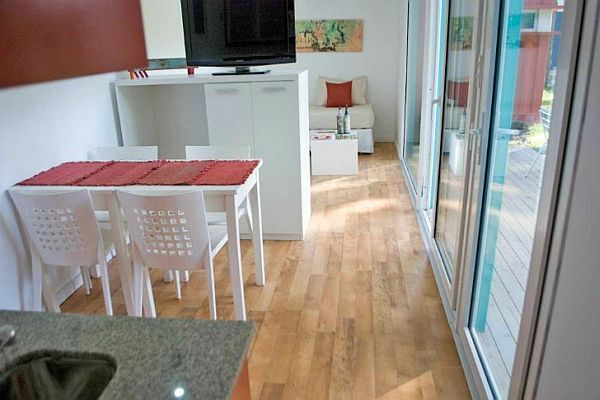 The compact space is divided and exploited at its limit in contrast with the usual shopping malls with huge parking lots and endless pathways. 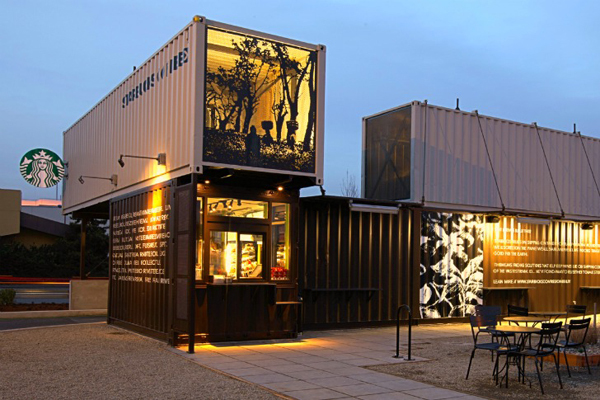 The entire mall is made out of 61 containers and 41 of them are situated at the ground section in simple rectangular footprint. The ingenious idea come straight out from a pure economical principle. 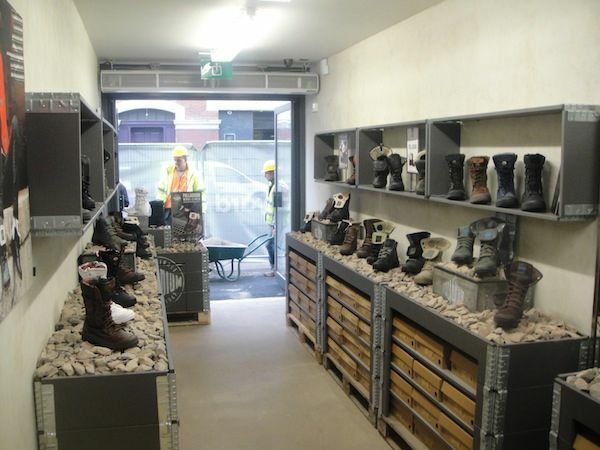 The small brands find almost impossible renting a big space in a fancy shopping center and therefore reaching to the general public with their products. 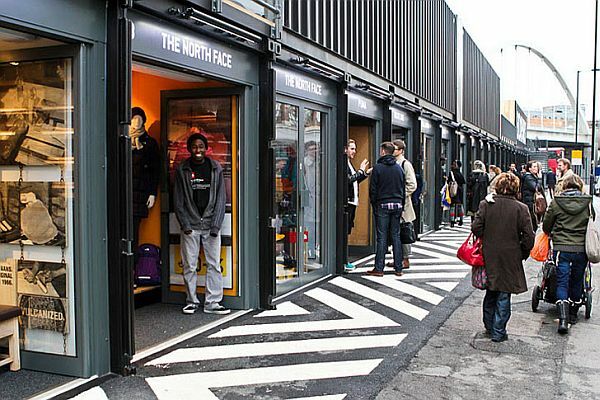 With this Box Park the situation is different and almost any entrepreneur can afford to rent one of the commercial spaces. 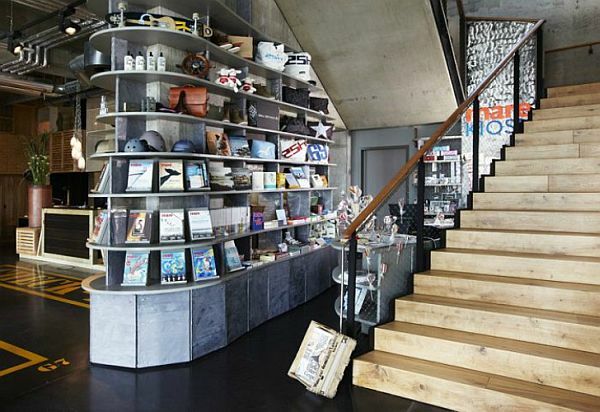 Let’s change a little bit the French sophistication and step a little bit to the north in Germany.Here Stephen Williams Associates designed a very interesting eclectic hotel inspired by sailing and shipping. 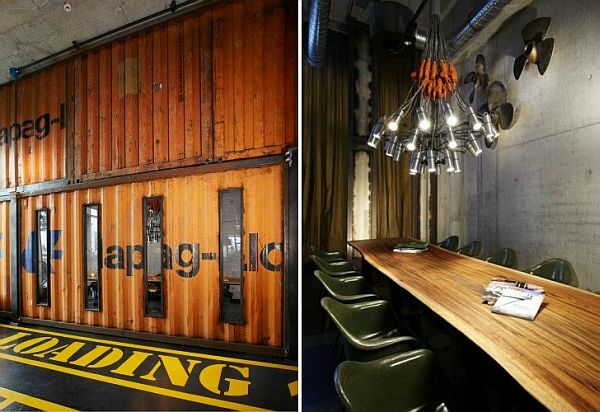 In the amazing décor shipping containers, ropes, rotors and other elements from the shipping industry were used to create the impression of a raw, industrial shipping warehouse. 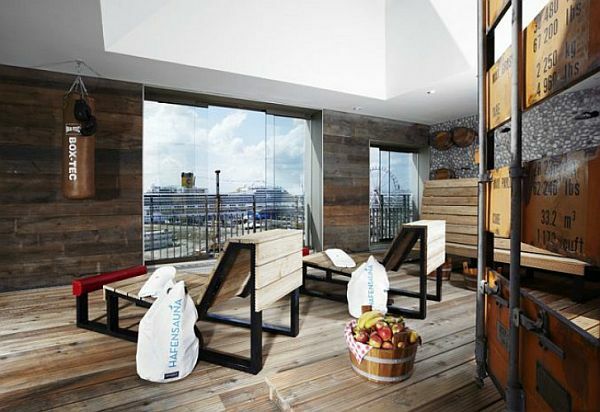 25Hours HafenCity Hotel has each room decorated to look like a cabin from a ship. 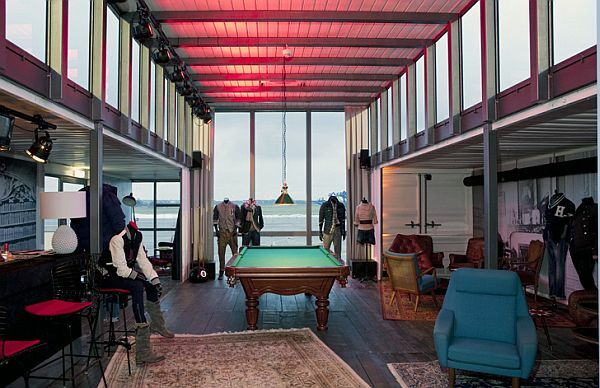 The rooftop is also made from a container and is houses the “Hafen Sauna” with panoramic views over the entire harbor. The lobby is the most interesting area featuring a variety of seating and lounging options, as well as the hotel’s restaurant that serves local dishes with local ingredients. 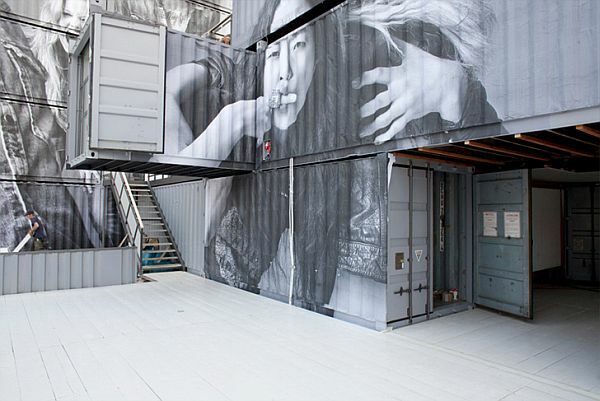 This unique project couldn’t be possible without the containers donated by Hamburg’s own Hapag-Lloyd as well as other scrap materials from all around the shipyard. 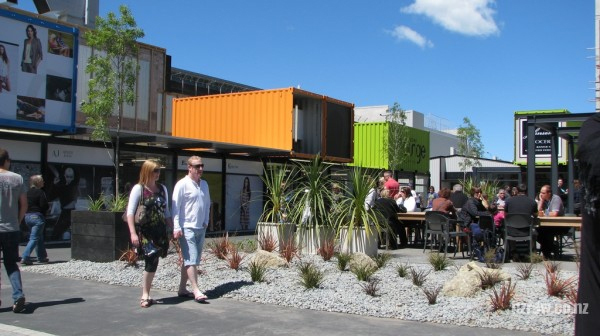 Another mall project was opened in New Zeeland but at another scale and with another philosophy. 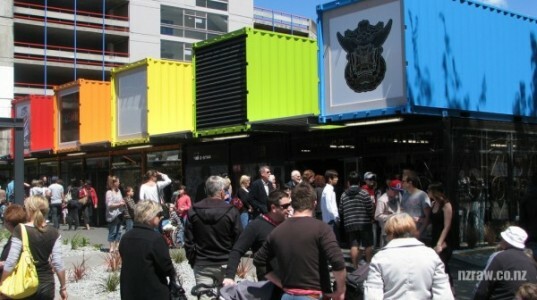 The Christchurch area was rebuilt after being devastated by an earthquake. This bright colored shopping facility houses 27 stores and is meant to bring a certain normality in the area, but it still not enough. 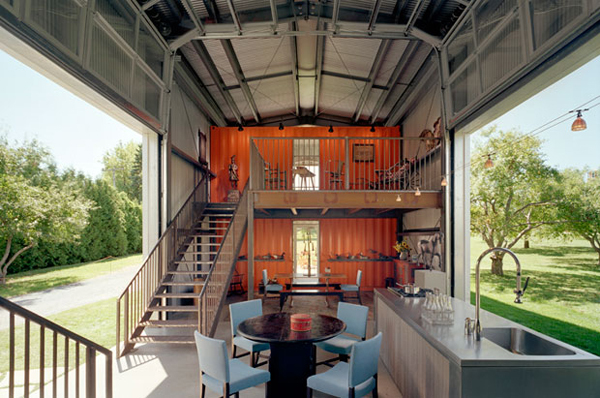 The benefit of using cargo containers is that makes people feel safe. I can’t imagine how all those people shaken by the nature’s rage can venture again in a town center with tall buildings , part standing and part being demolished. This meaningful project is more than a shopping facility it is an element of safety for those residents. 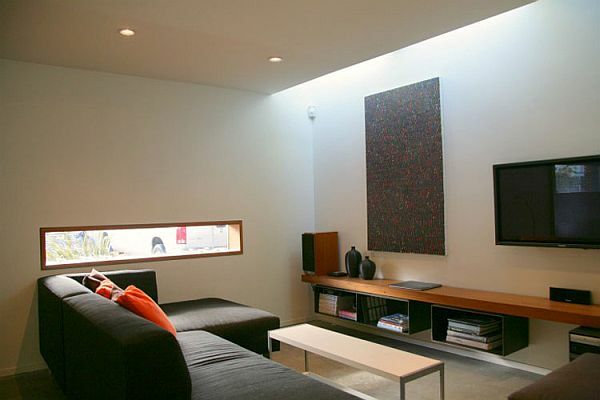 The structure of this project is not equally compartmented some benefiting from larger space than other ones. 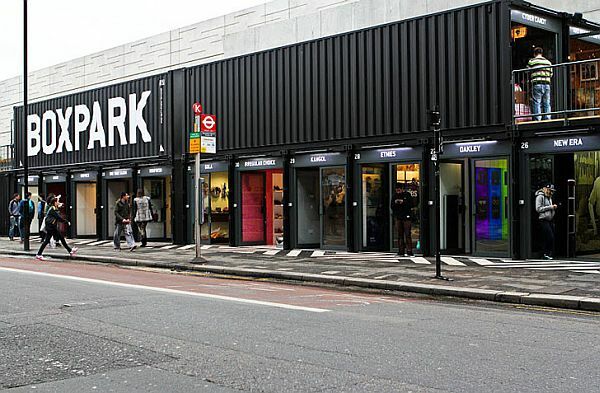 Its design is also disputed between the developers of the Boxpark Mall we’ve seen earlier and this one, claiming intellectual property theft and seeking legal actions so solve the issue. 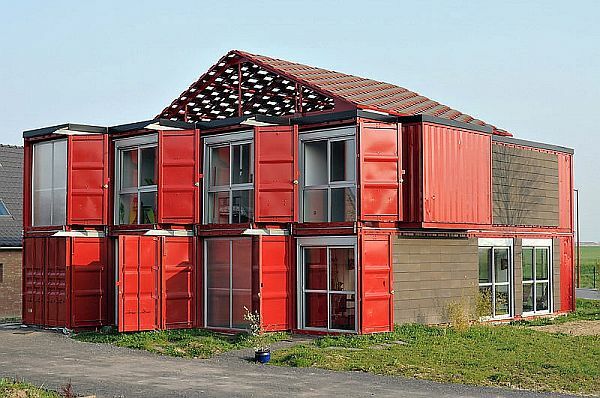 I strongly believe that this by far the greatest project ever involving shipping containers. It is called the WIngHouse and guess that? 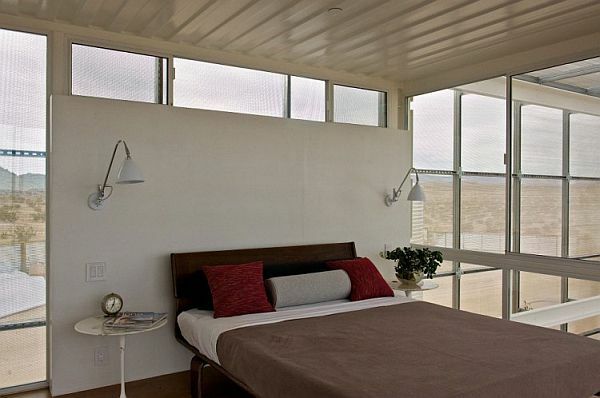 It unfolds as a spacious house from a single cargo container. 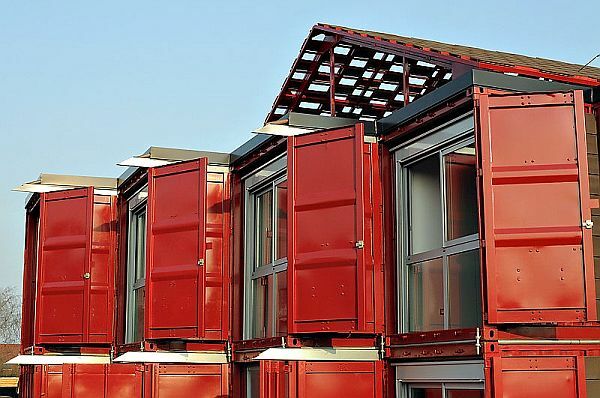 The principle is relatively simple , pack everything in a container so it would be easy to transport anywhere and then set it on the ground, then the walls of the container sized unit rise up like wings with a built in crane to create a large butterfly roof. Inside panels are inserted as we want to build doors and windows. 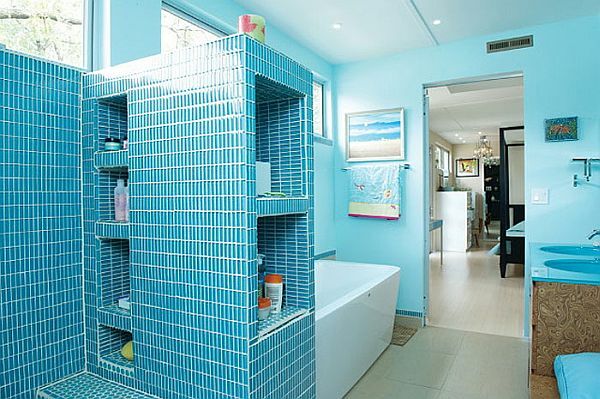 The amazing result features a quite large interior space that can be finished in multiple ways due to the lack of internal support. 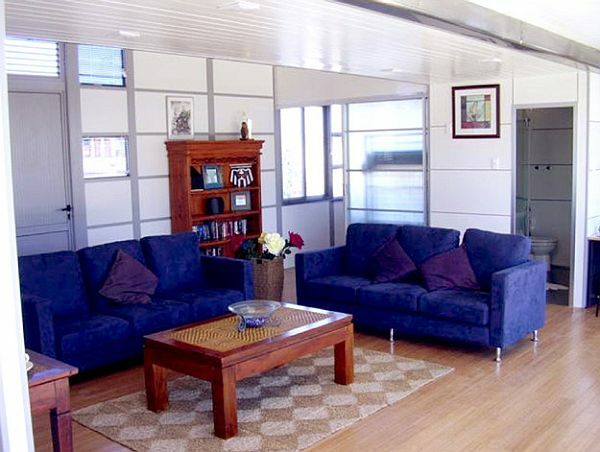 Thanks to this feature this amazing home can accommodate three bedrooms as a standard living home, or it can be transformed in a 8 bedroom dorm , an office or about anything you would like. 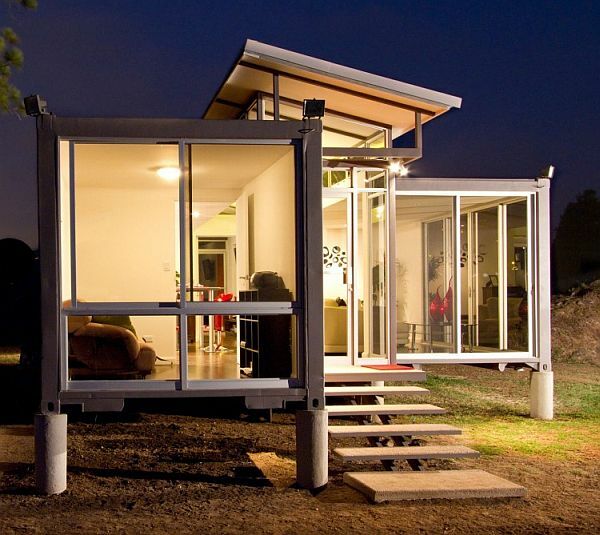 This WingHouse revolutionizes the concept of home and moving around. 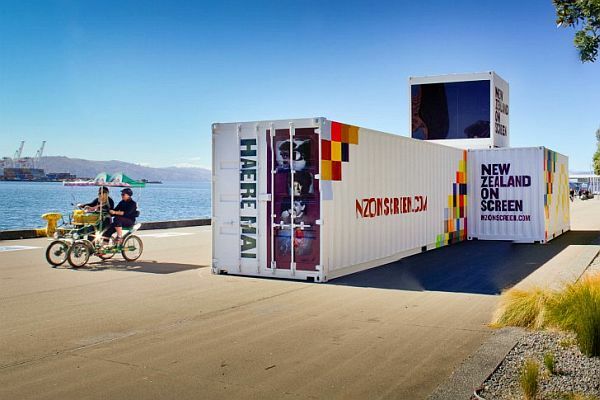 A project called New Zeeland on Screen feature TV and music videos right on cargo containers. 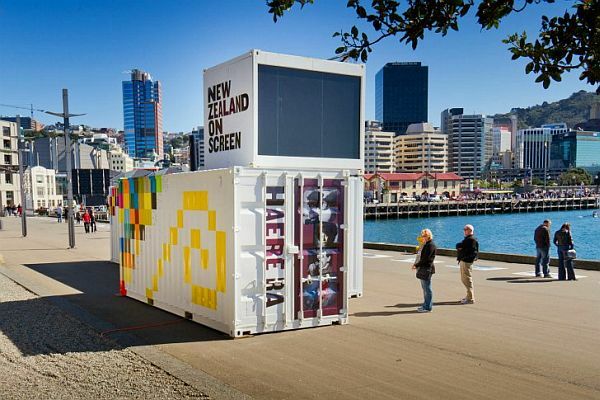 The Kiwi Films organization wanted something original to engage visitors using hi-tech facilities and gadgets , so they equipped some containers and transformed them into interactive media rooms. 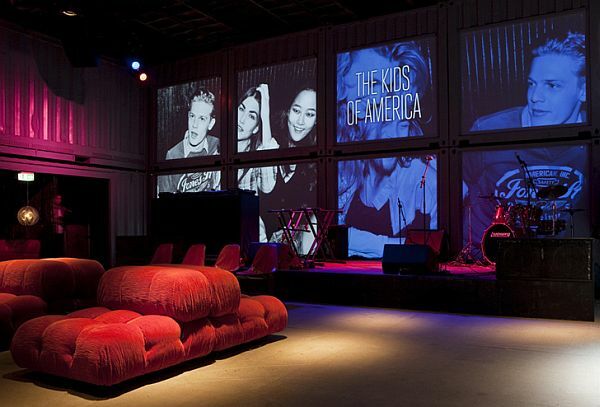 Inside them people can enjoy end experience a state-of-the-art interactive video wall and a lot of other cool applications. 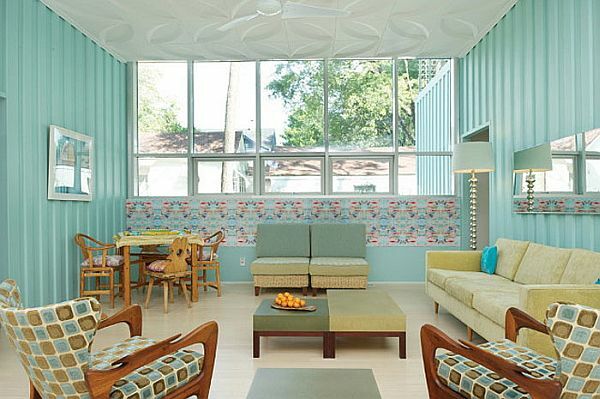 The owners opted for a vintage décor to go hand in hand with classic films and to bring back a certain nostalgia. 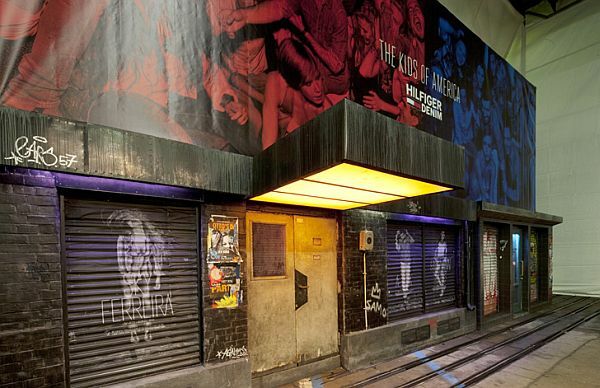 The idea behind this project was to combine the offline and online environments to give the media content more currency without having to build a museum or a movie theatre. 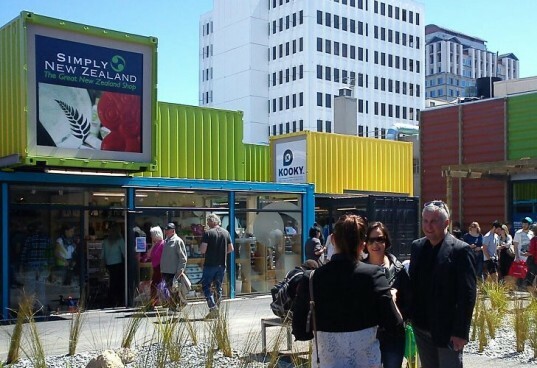 Now it is easy to understand why they have chosen shipping containers. From the outside the facility looks casual, like a crashed truck painted colorfully . 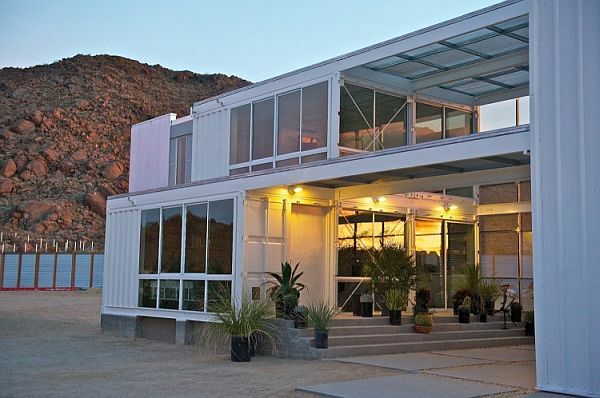 Also a grand design project made out of shipping containers is this one. 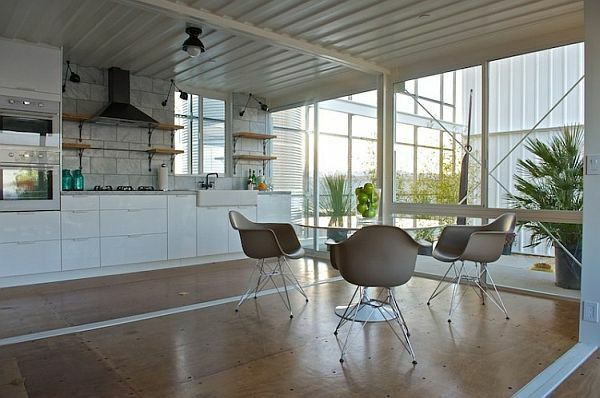 This single family house designed by Jason Welty is the perfect example of industrial elegancy. 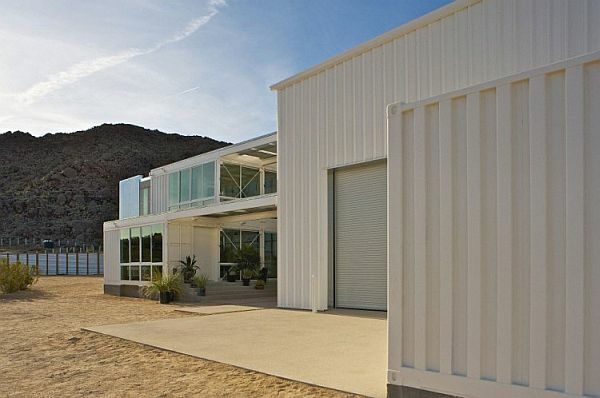 Although the metal frame was not covered but only painted in white the overall feel is of refinement. 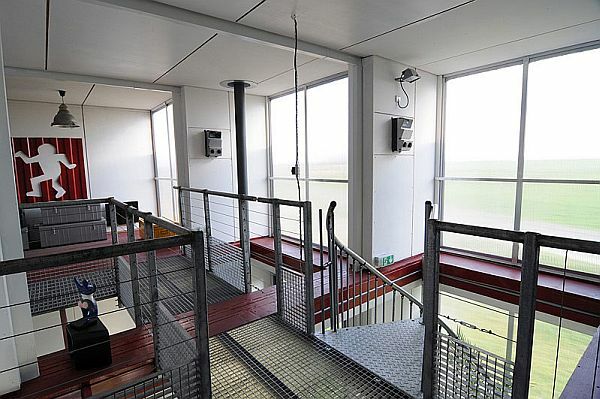 The interior is compartmented in two floors. 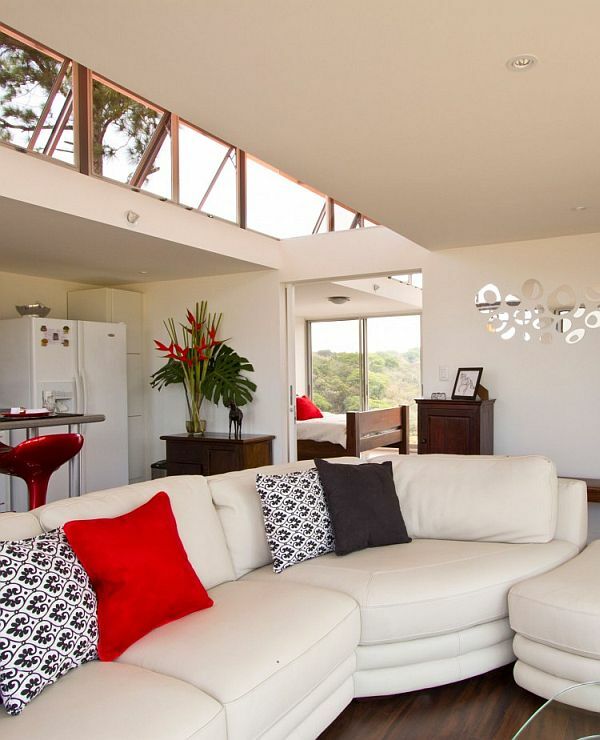 At the lower level we find a big open living area furnished simply with plenty of natural light coming in from multiple large windows, upstairs there are the bedrooms, also furnished in the same style. 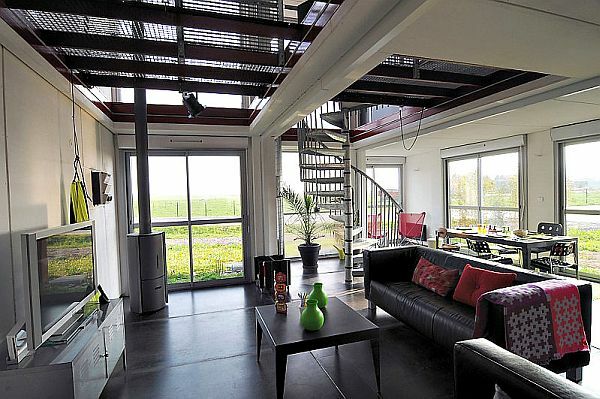 Focusing on sustainability this house has solar panels on the roof and several wind turbines. 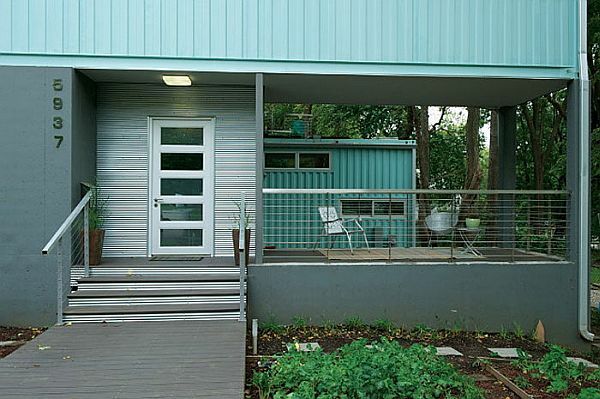 The outside color tries to blend the building into the natural décor. 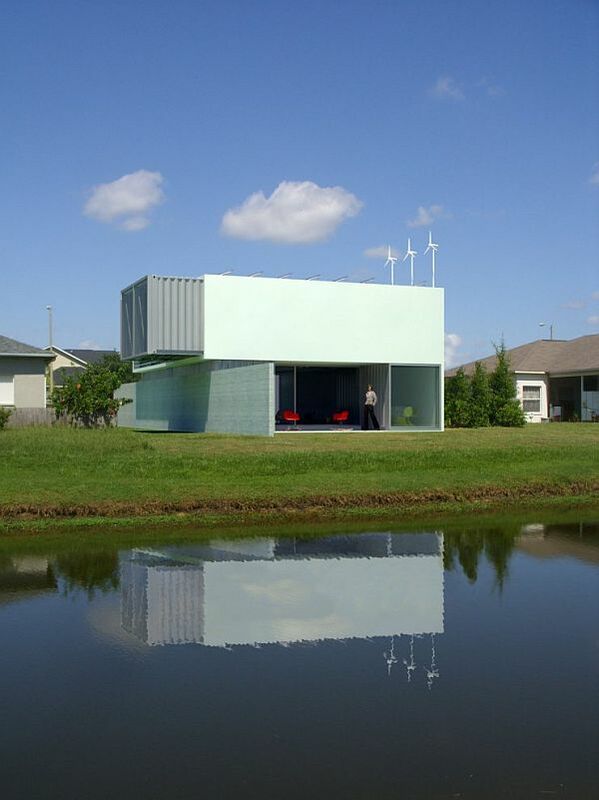 The land is located in very beautiful area with a lot of green grass and a back yard pond. 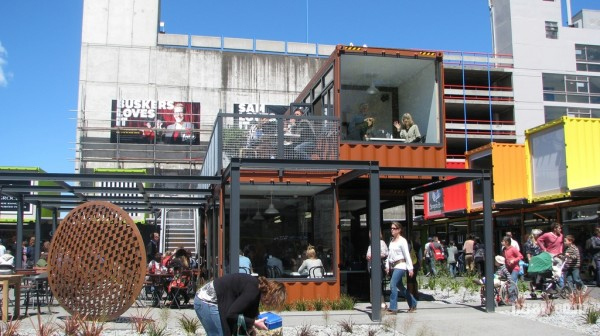 Suddenly cargo containers look stylish and environmental friendly within this project and I would like to see more and more of these buildings rising in the nearby future. 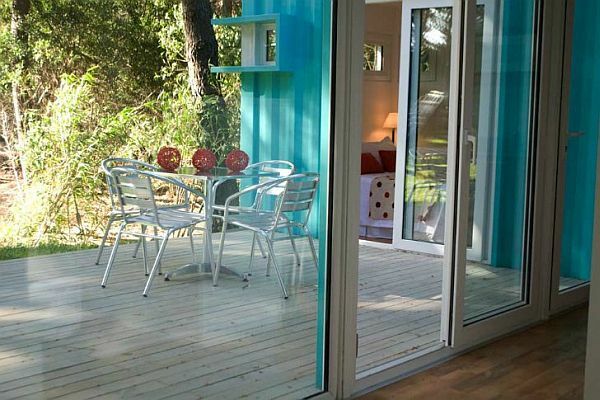 In this particularly project we’re going to see how a common shipping container is being transformed into a summer residence, perfect for nature lovers. Similar to those who go camping in the summer time some people decided to build their own summer residence. 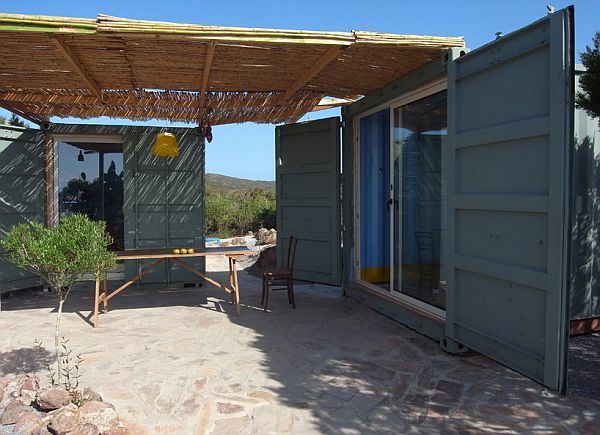 With a good cleaning and removing all the rust ( if it has) and some paint the containers are ready to accommodate you in a quite primitive way, but it’s summer time and you only need basic a shelter to protect you from rain, wind and wild life. 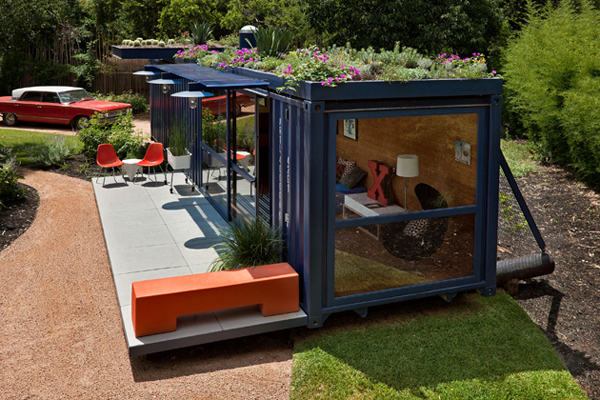 These two containers have a small shady area covered by a simple cane roof perfect for eating , working and so on while still enjoying the fresh air without the sub burning your skin. 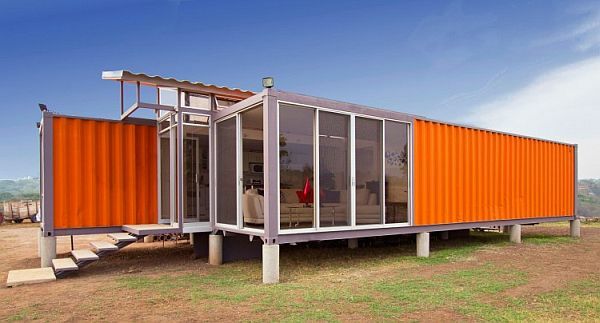 A big problem with steel containers is insulation and in this particular environment with almost 300 days of sunshine per year, heat is a serious problem. A new product has been developed to reflect the sun heat and act as a insulator , It’s called SUPERTHERM and is a very effective ceramic paint, with remarkable effects. 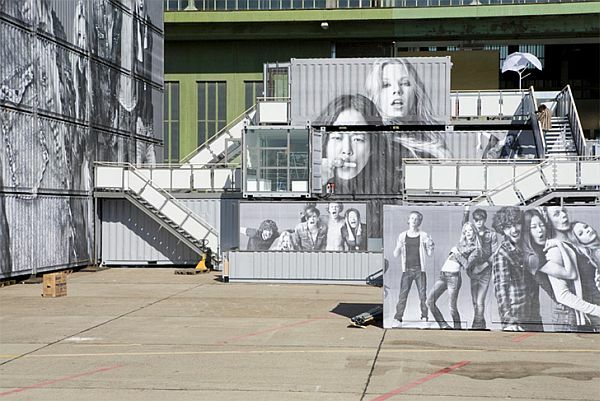 This project build by Art department-Berlin was presented to the Breat&Butter fashion trade show. 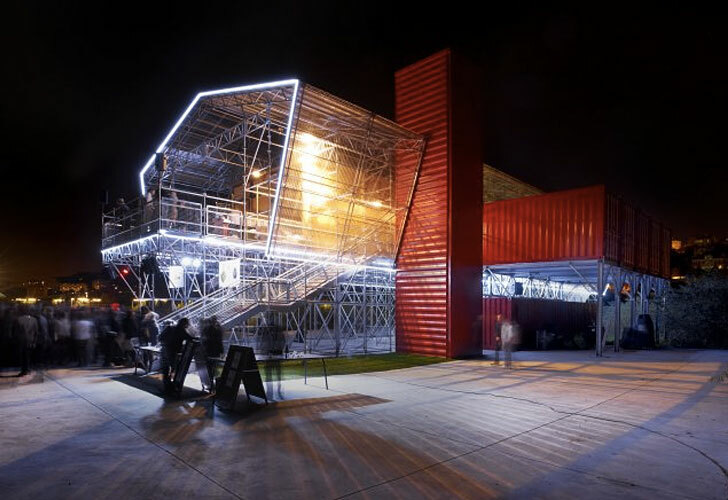 Tommy Hilfinger brand was represented by a contemporary structure that was made up entirely from recycled cargo containers , which were stacked in various shapes and covered in eye-catching graphics. 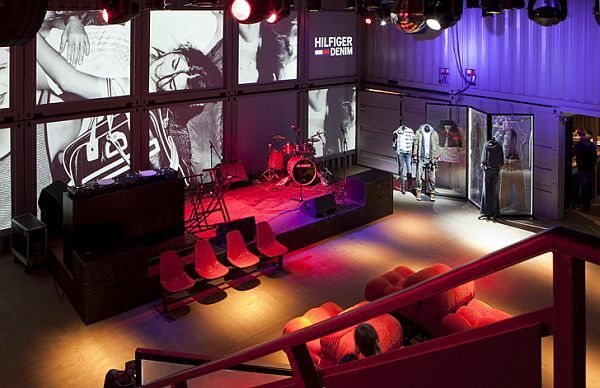 This dynamic environment reflects the energy of the Hilfiger aesthetics using in the same time eco –friendly materials both inside and out. To paint a mental picture about how fast these structures can be assembled and functional I have to mention that the containers only took one day to be arranged, three days for rough constructions( cutting, welding, mounting stairs, light etc) and another three days to finish the interiors. Imagine that in this amount of time you can be already living in a house make by the same principle. 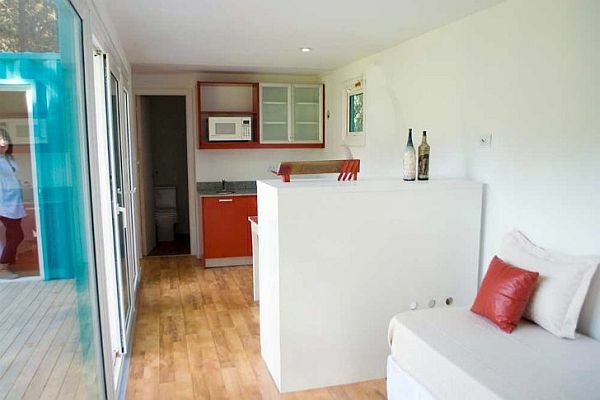 Imagine that in just one or two weeks you can have dinner in your own place to call home. 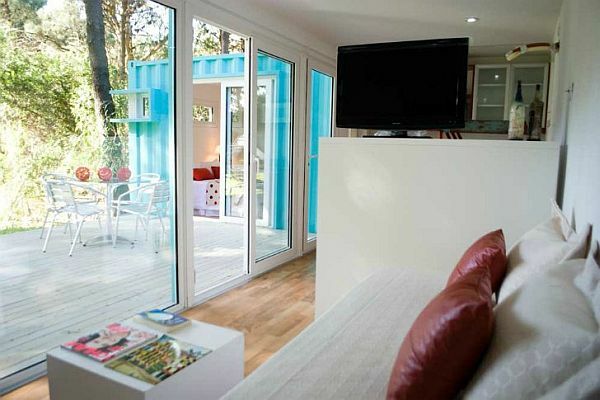 Living in shipping containers initially started as a fun challenge but now it has become a worldwide movement and more and more people seek an unusual refuge. 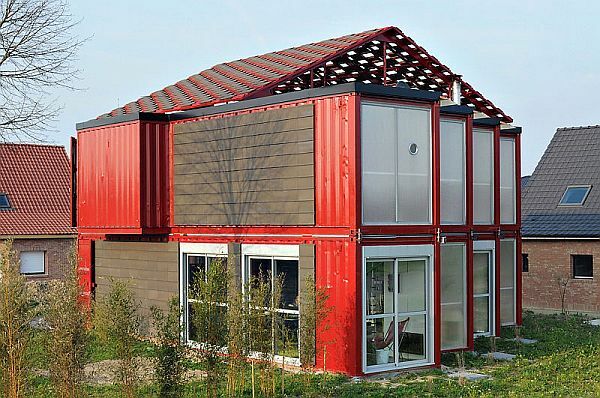 Shipping containers offer them a solution. 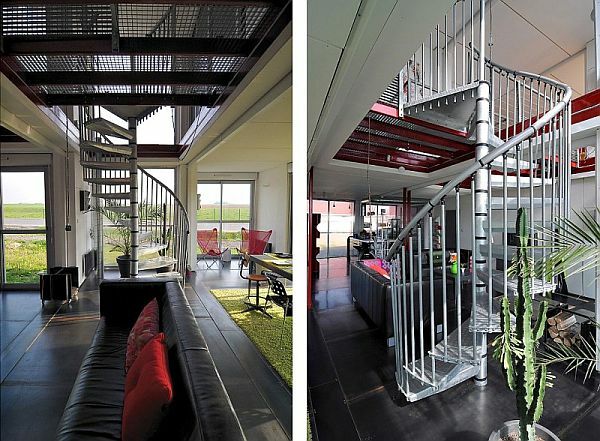 Would you see yourself living in one?